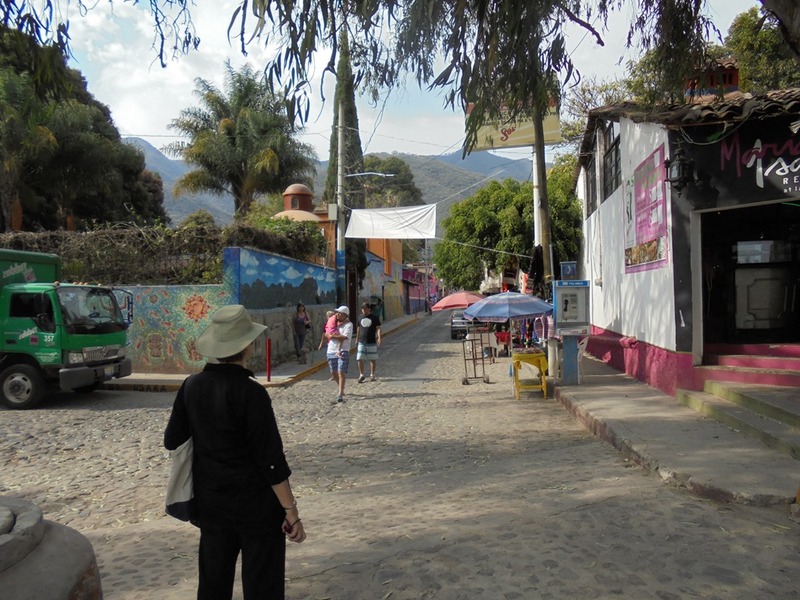 We are in Mexico now, and getting familiar with the area we think we will live. 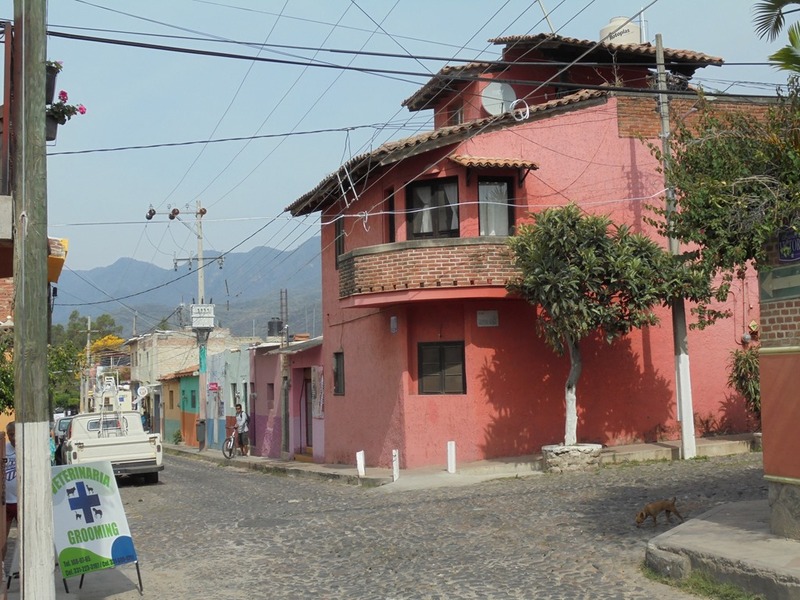 We are staying with friends in the biggest American and Canadian expat area, Ajijic. 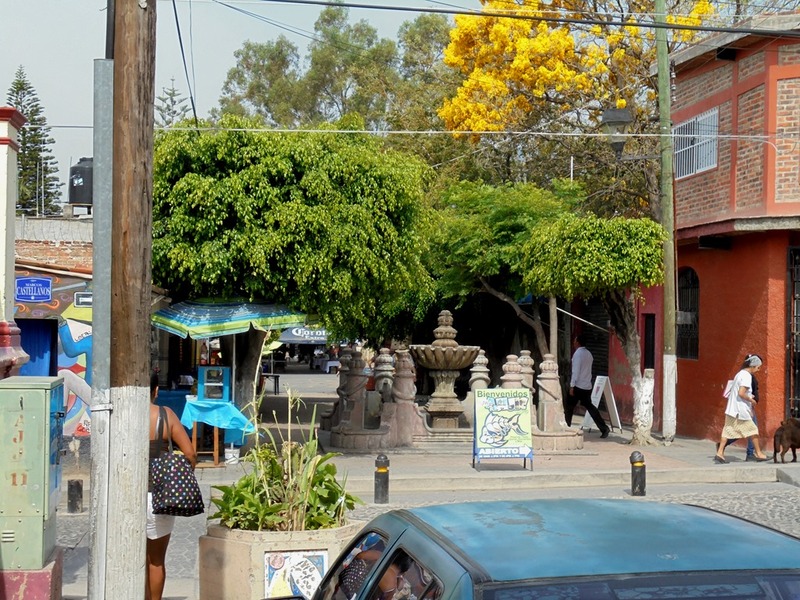 Ajijic is a picturesque town of about 10,000 people, not including the influx of winter visitors. 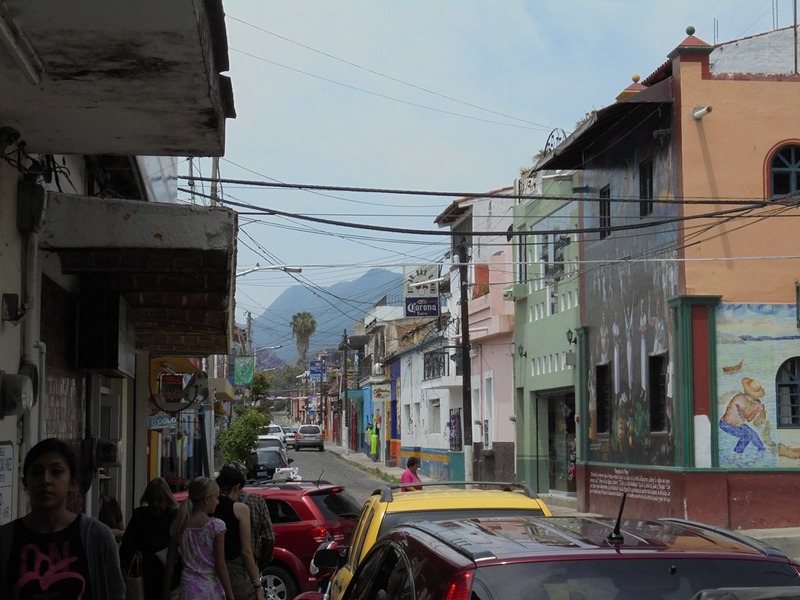 Thousands of expats live in the area, and Ajijic is the center of expat life here. I wanted to write about our first impressions while they are fresh, and so this post. It is based on the first evening and next day here. We walk in that direction. 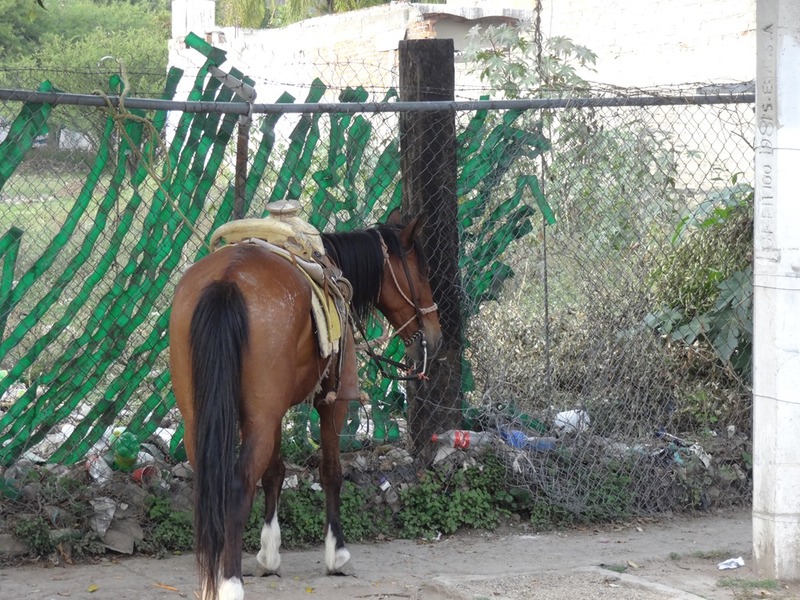 First we see this horse. 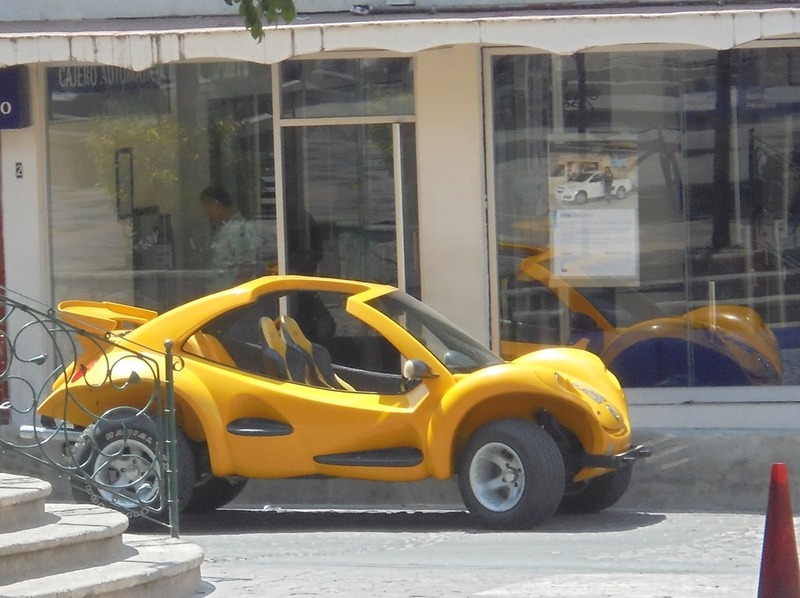 I guess for rental to tourists? 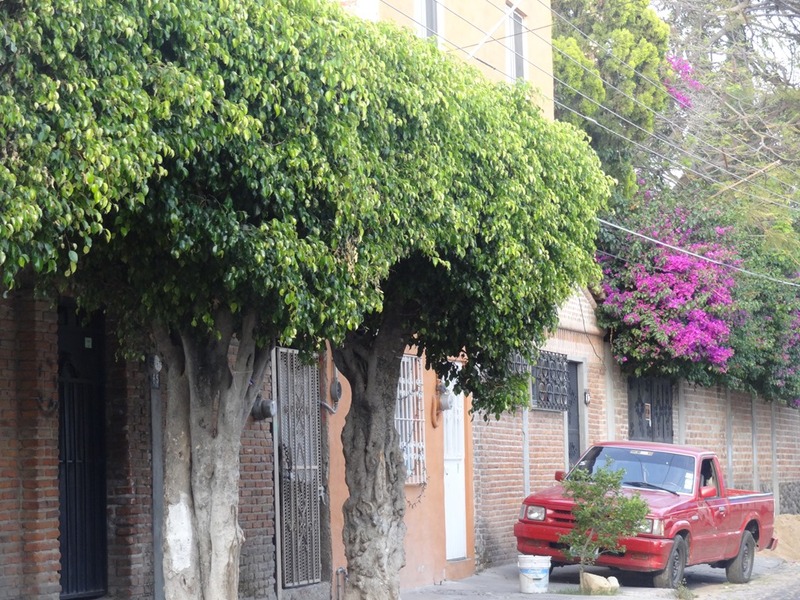 Old trees grow next to the street. Colorful bougainvilleas are common here, just like India. 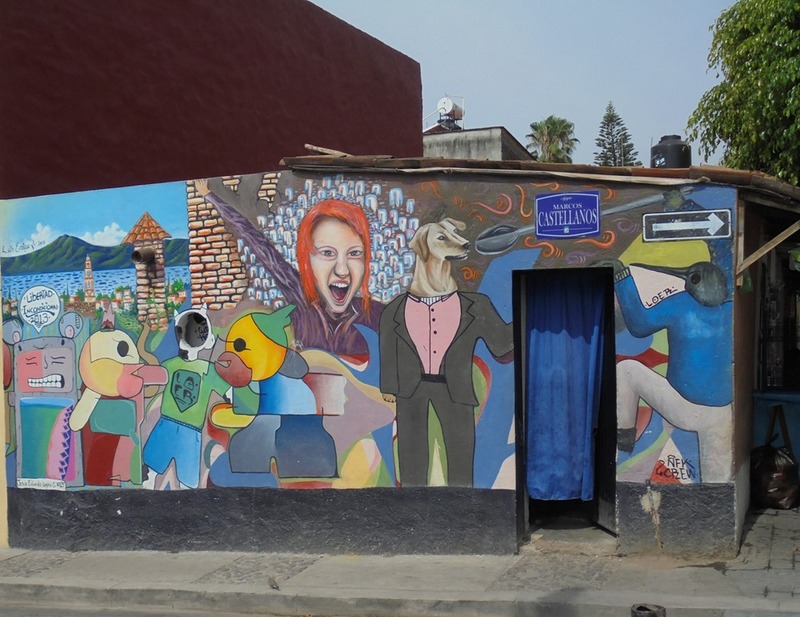 Interesting painting on many buildings. This one has a branch of a tree, with a few flowers on it. View down a street. 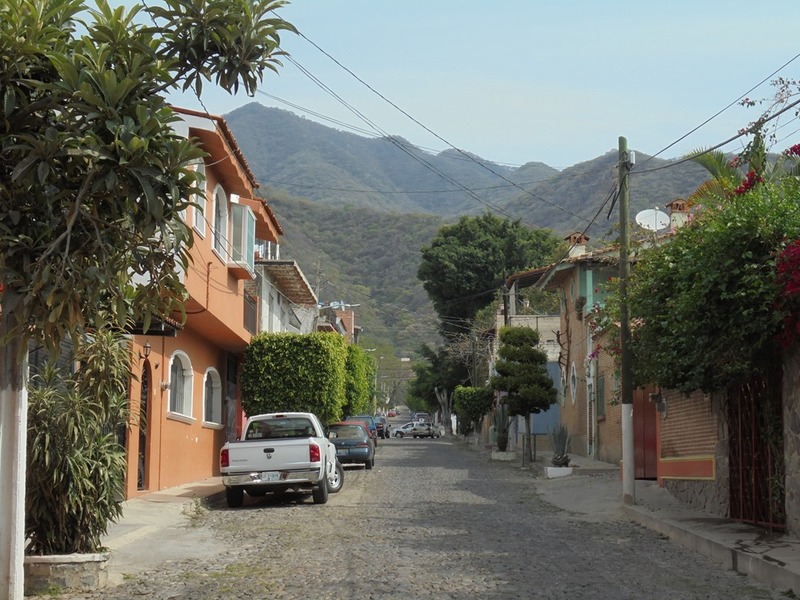 This view is typical, with brick houses, their fronts right next to the street. Many, I think, lead to nice spaces with an interior area open to the sky for light and ventilation. 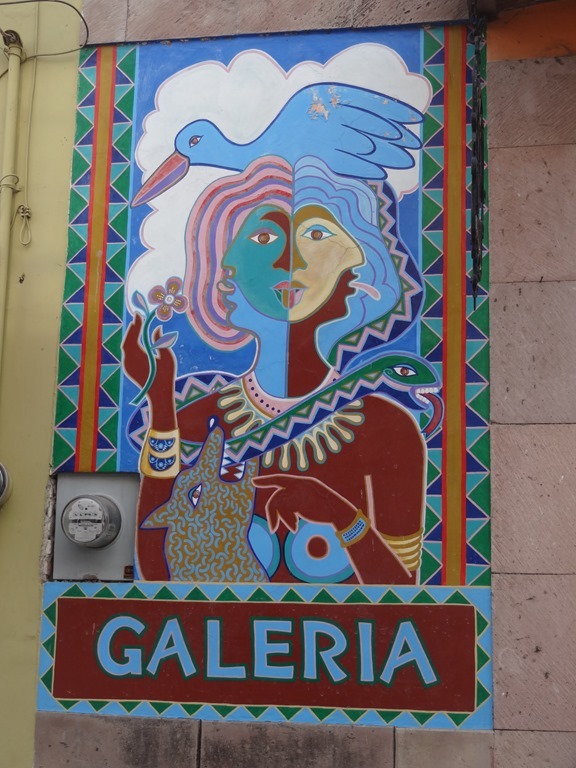 This is one of the many art galleries, named El Gallo Gallery, or “the chicken gallery.” I don’t know what the deal is with chickens, but there are other examples around town. 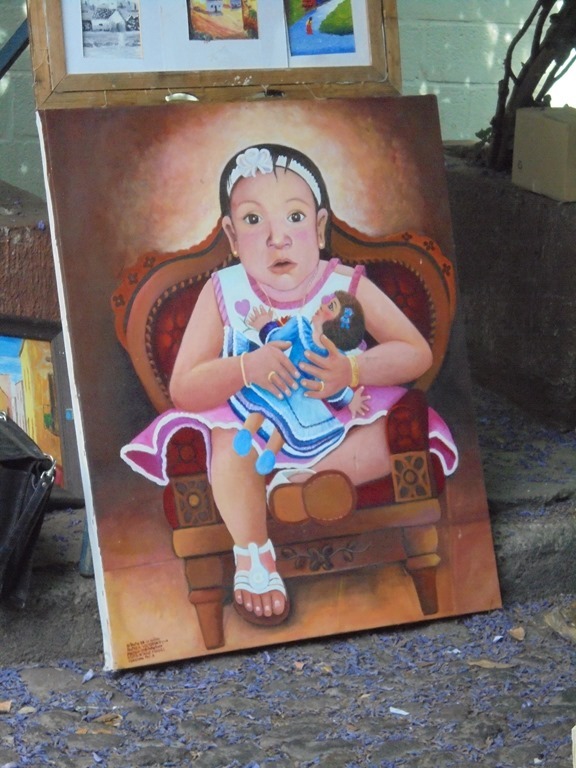 A chicken artist, painting a portrait of another chicken. 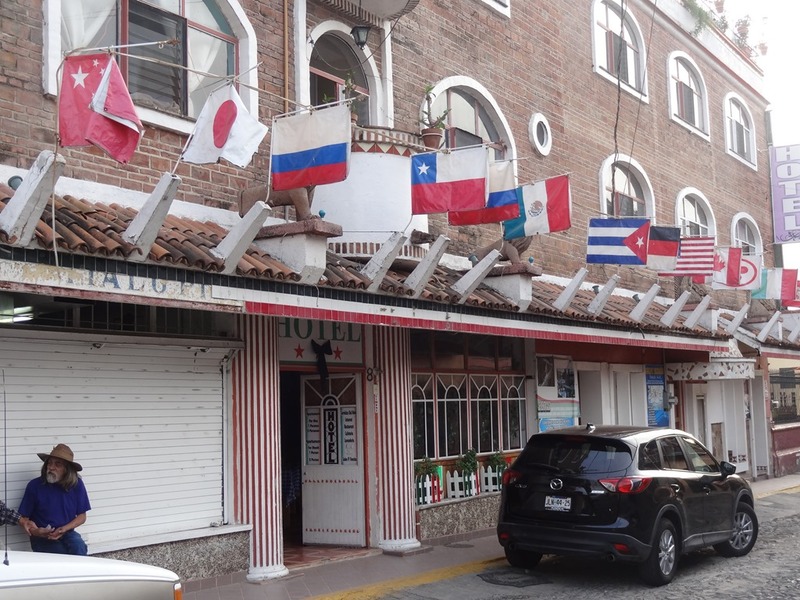 A hotel near the center of town, with flags flying, I guess from countries from which they have visitors. 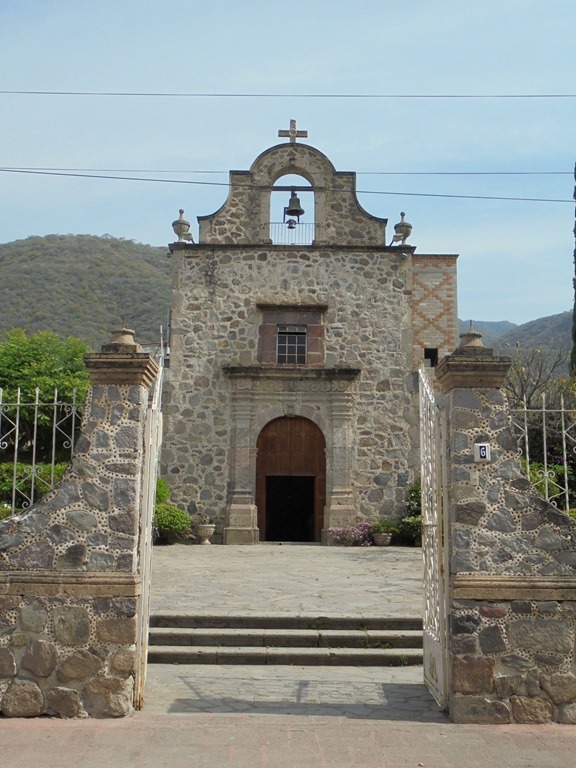 The entrance into the main plaza area. Paintings line the entranceway. 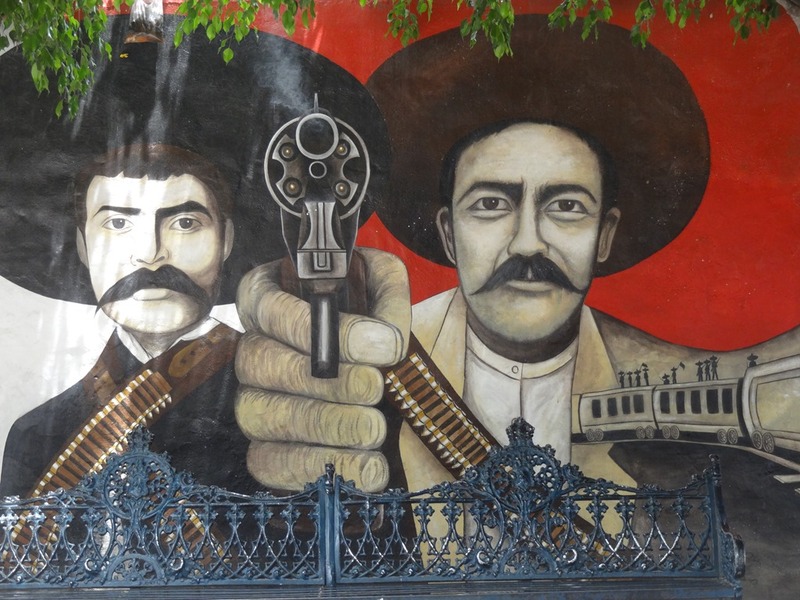 The one below was, I think, done for the 200th anniversary of Mexican Independence in 2010. 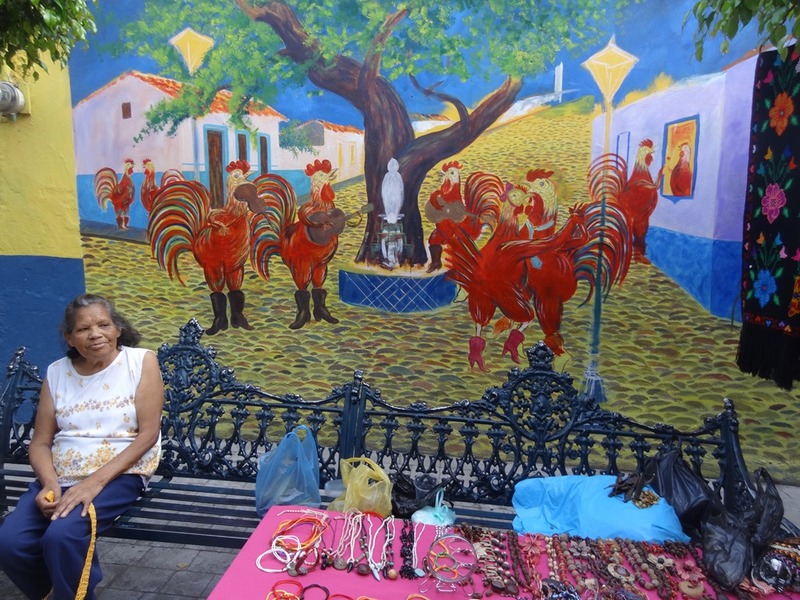 More chickens—musicians and dancers—in the plaza. 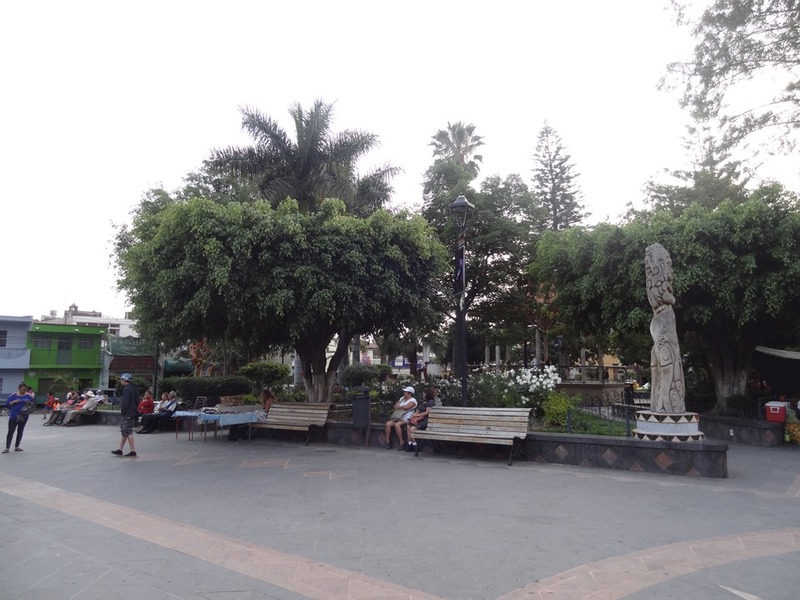 The central plaza. It is evening, so not very good light. There is a music stand in the center, not visible in this photo. 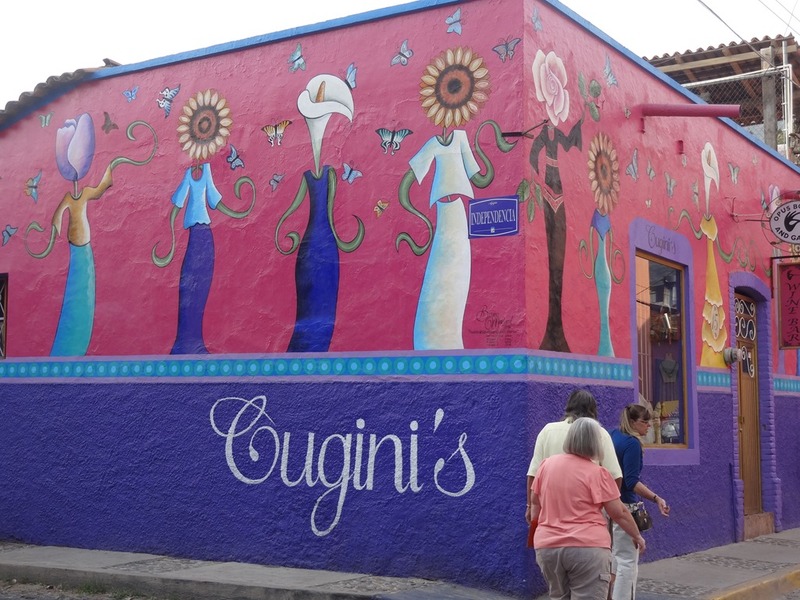 One of the restaurants that front onto the plaza. We ate here this evening. 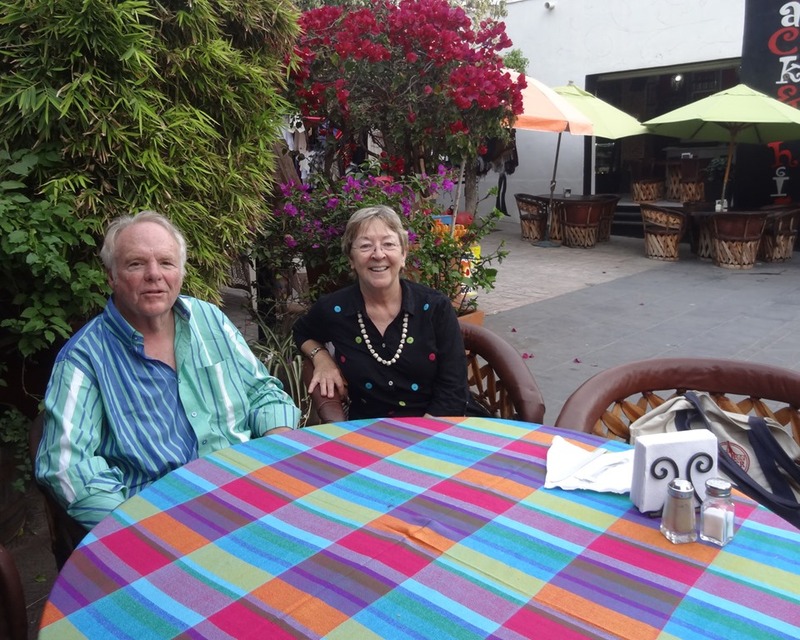 Carol and I enjoy our first meal in Ajijic. 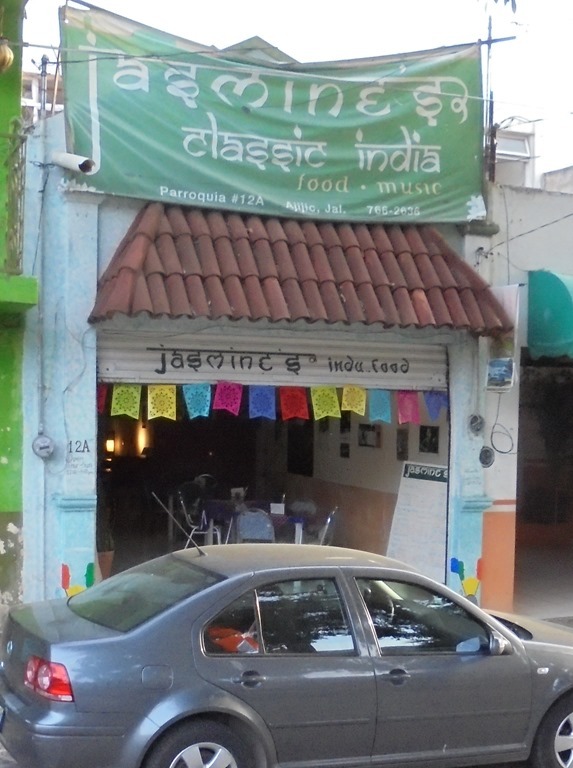 It is kind of funny; a reason why we came here is for better non-veg food than we could get in Tiruvannamalai. But after a long period of sickness that resulted in a visit to an Ayurvedic practitioner, we are much more vegetarian than before. 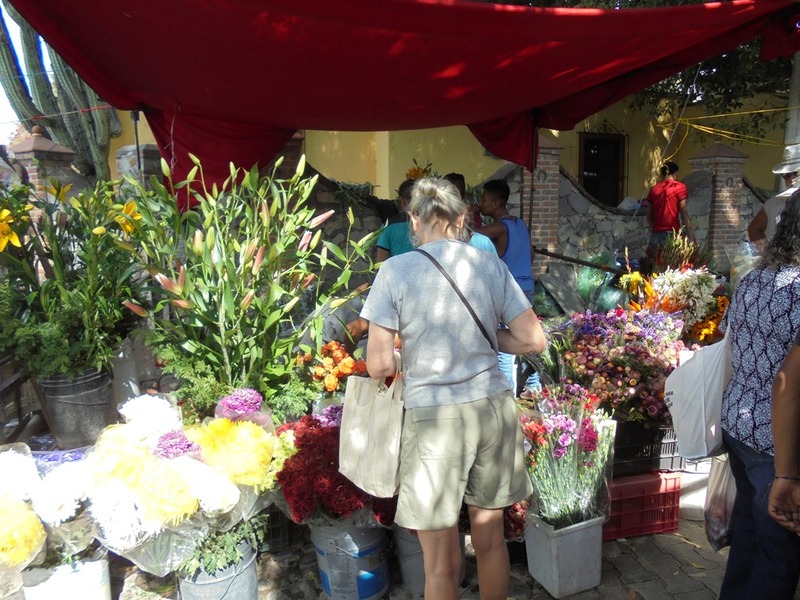 The next day, Wednesday, there is one of the weekly markets (that happen in different locations around the town about half the days of the week). 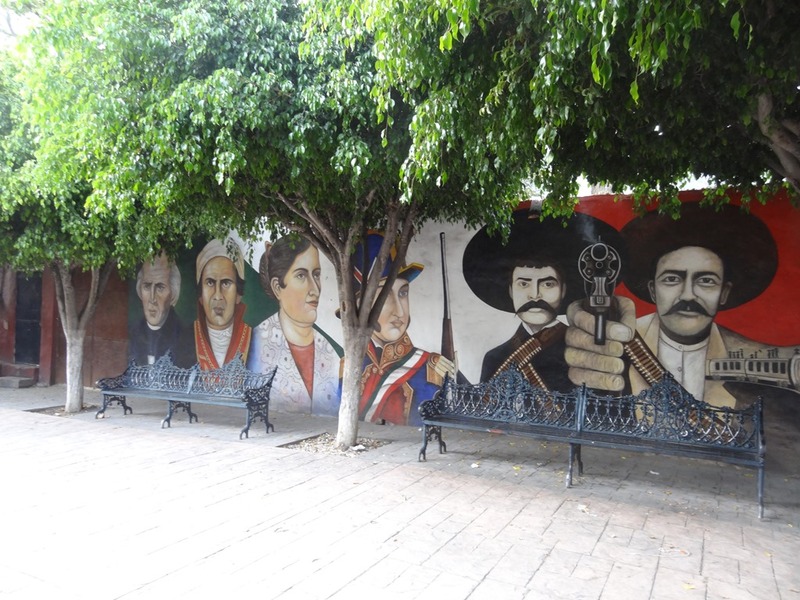 This one was along the length of Revolution Street and was more for expats and tourists than locals. 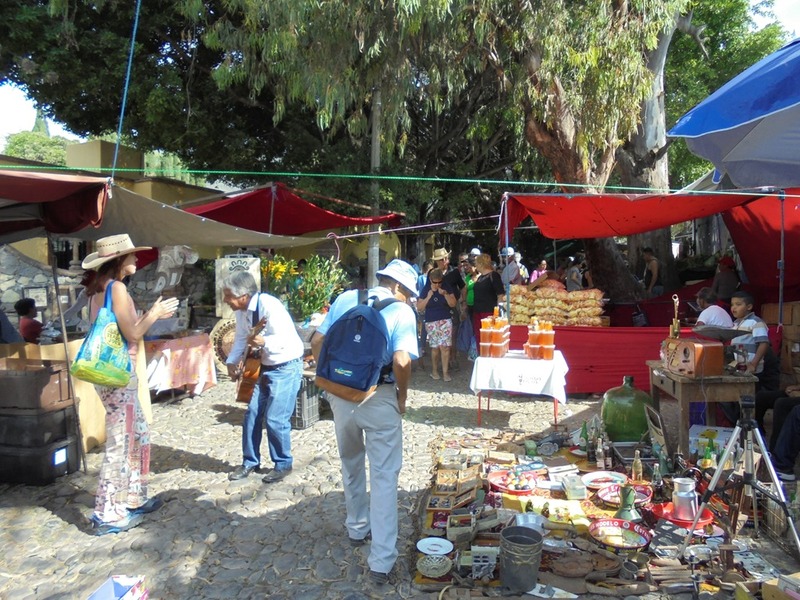 Vendors line both sides of the street. Many have great looking fruit. Fruit, nicely packed to take home. 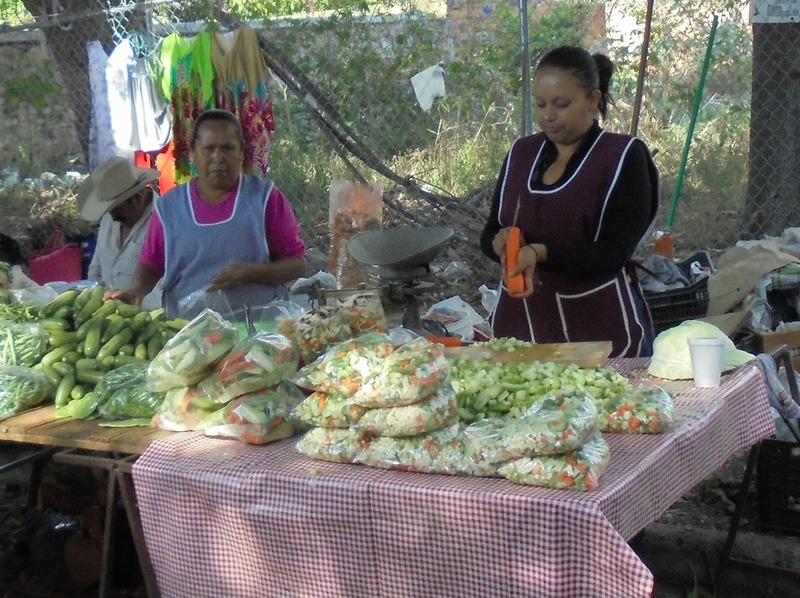 Vegetables, chopped and packaged in bags to take home and throw right into the dish you are making. 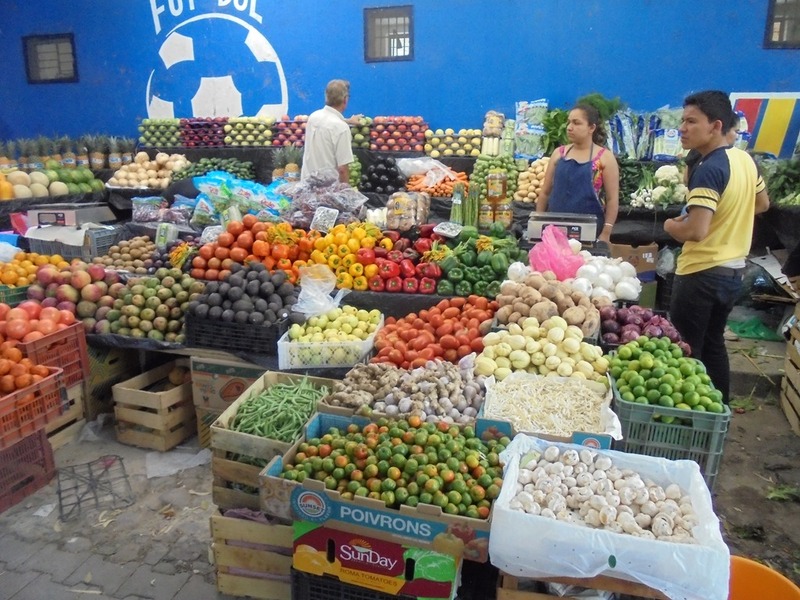 Great fruits and vegetables. 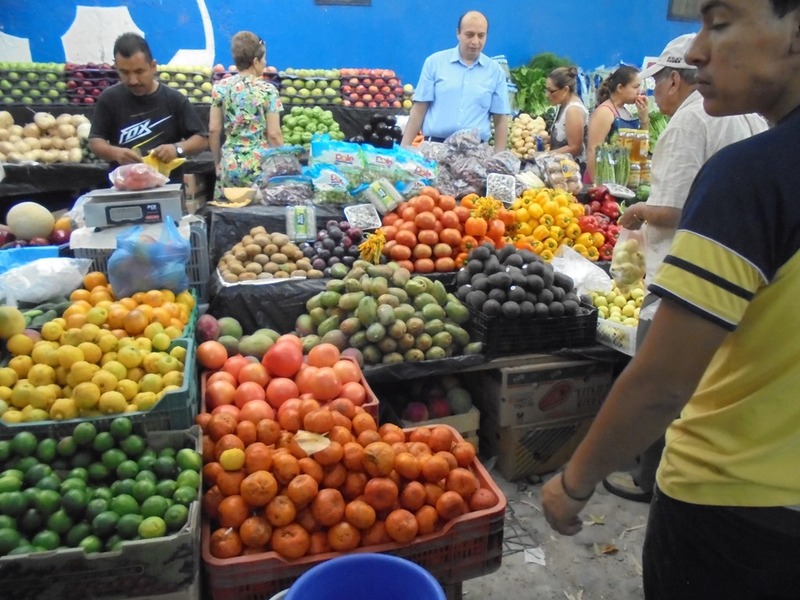 Many are of the same variety as was available in India, but bigger and more colorful. 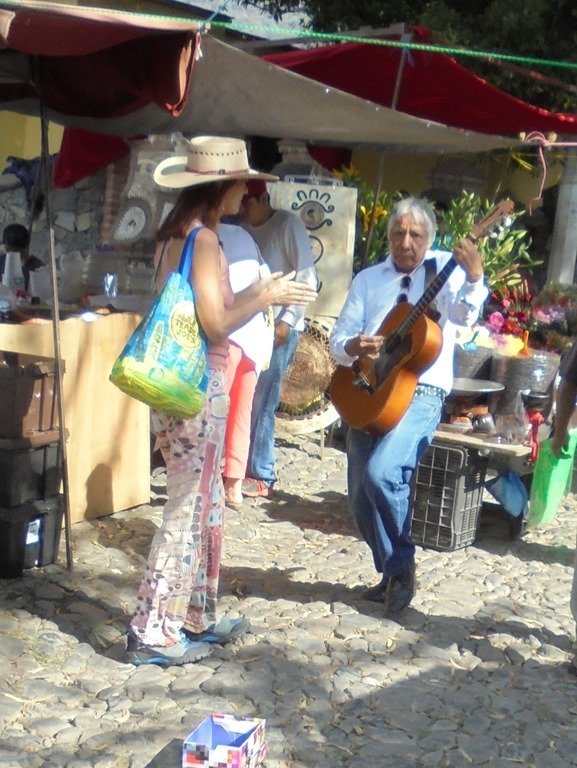 When we got to the downhill end of the market there was a musician and an American woman dancing. I know she is American because of the Trader Joe’s bag on her arm. This popular high-end grocery chain only has locations in America. 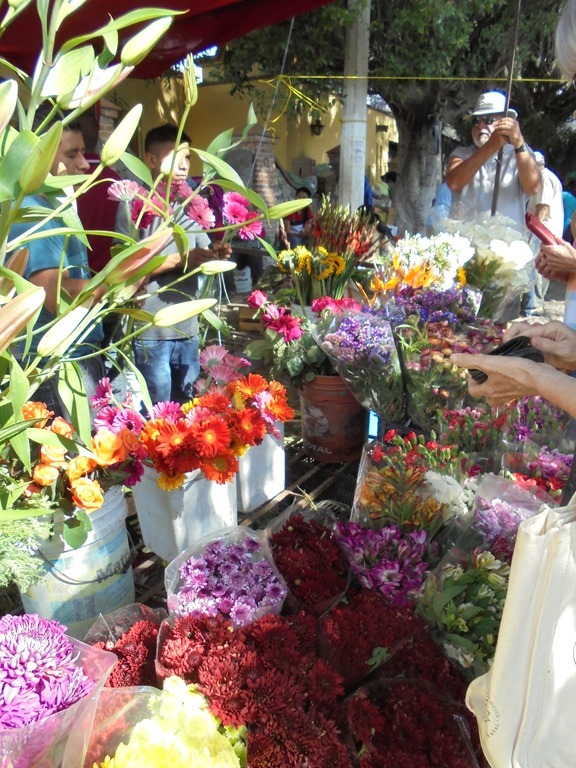 Some vendors specialize in fresh flowers. I saw many people leaving the market with armloads of these. 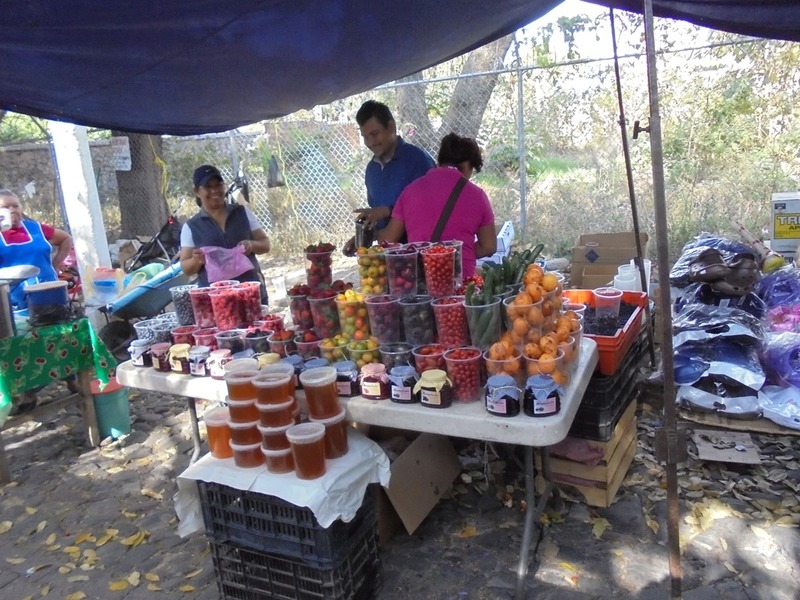 One of the nicer fruit stands. 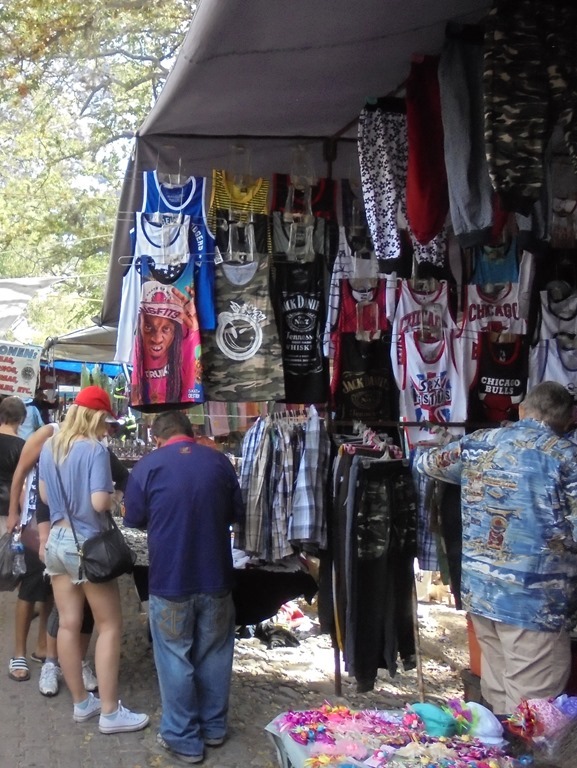 Clothing was a popular item in the market. 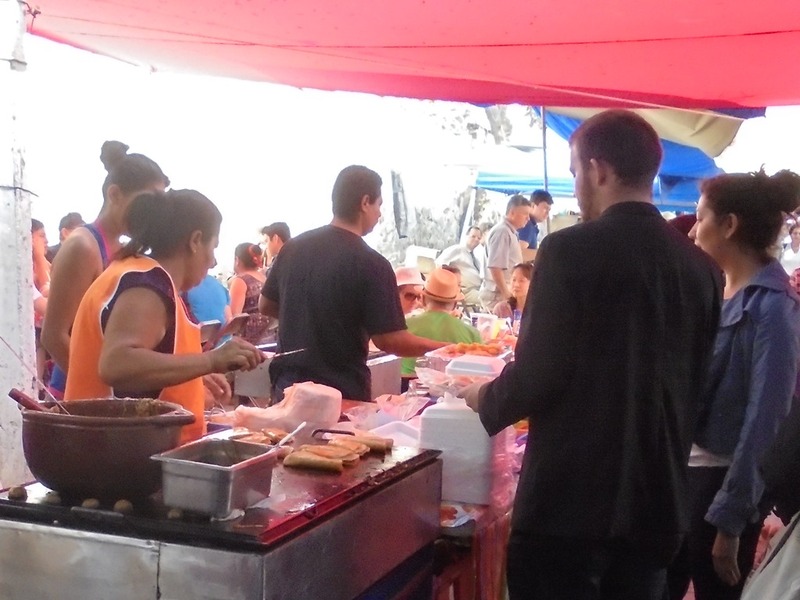 There were several food stands. I think the food is pretty cheap. Lots of people were eating here, sitting at tables they provide. Jewelry was another popular item. I was interested in the ring-bracelets in the photo below. 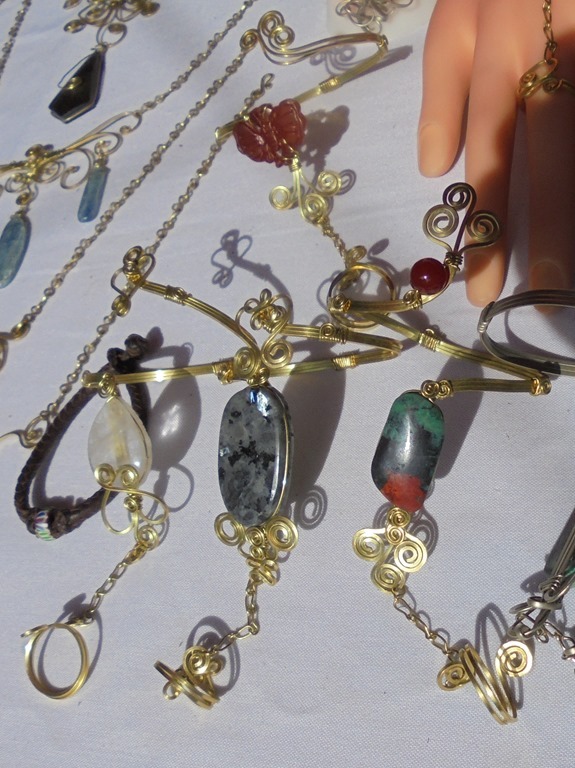 Carol’s daughter Amy, when she is not writing, producing or acting in comedy shows, or teaching yoga, makes fantastic unique jewelry, including ring-bracelets. Amy’s one-of-a-kind items can be seen and purchased at https://www.etsy.com/shop/CasualFabulous. There was a painting booth, run, I believe, by a husband and wife who are both painters. They both were painting in the front of the booth. 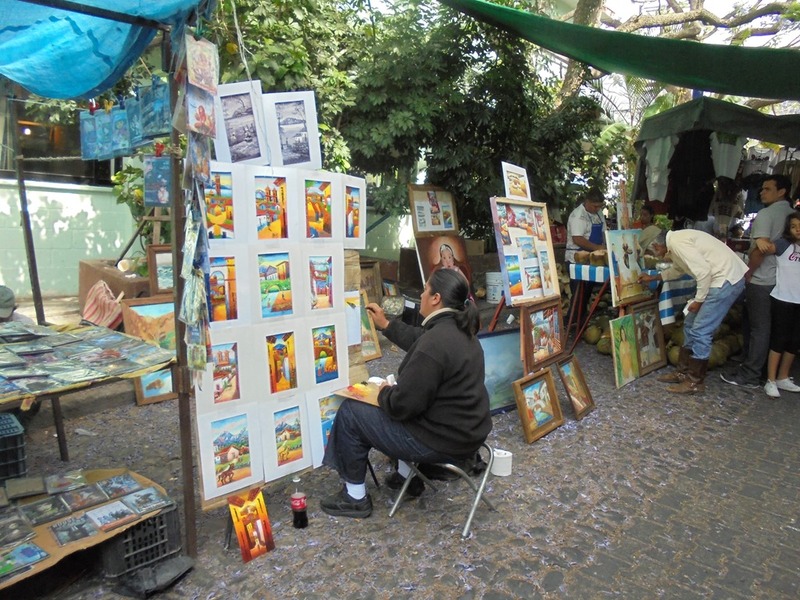 A couple of their paintings. 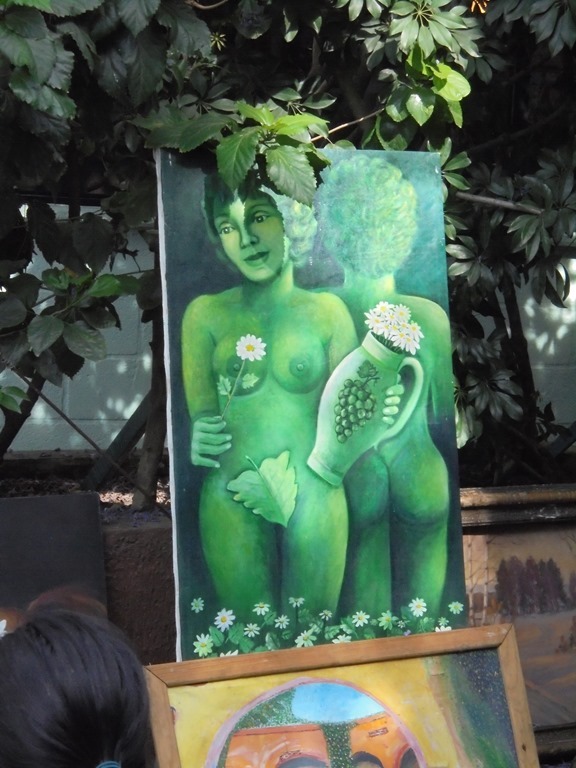 The first, a green woman. The other, a girl and her doll. I bet this is a family member. 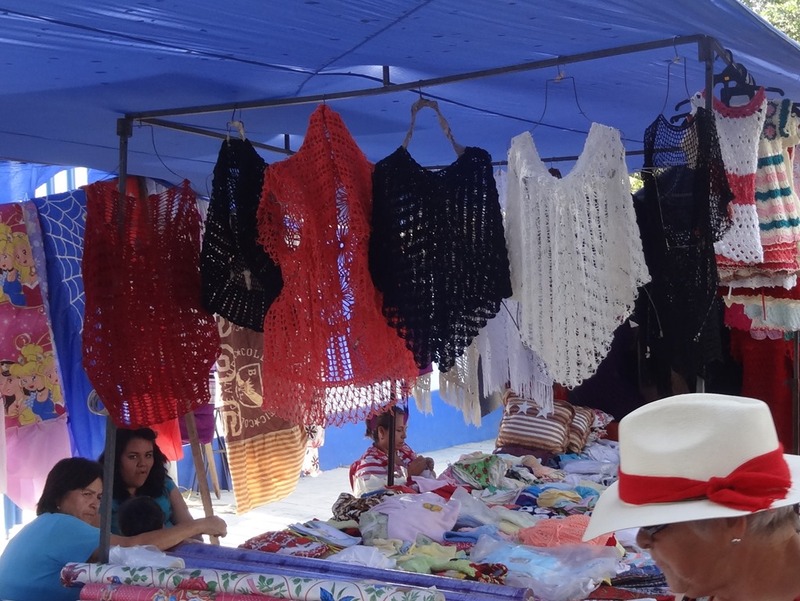 Carol eyed these open-pattern lacy tops. Two women were in the booth, crocheting more of these. 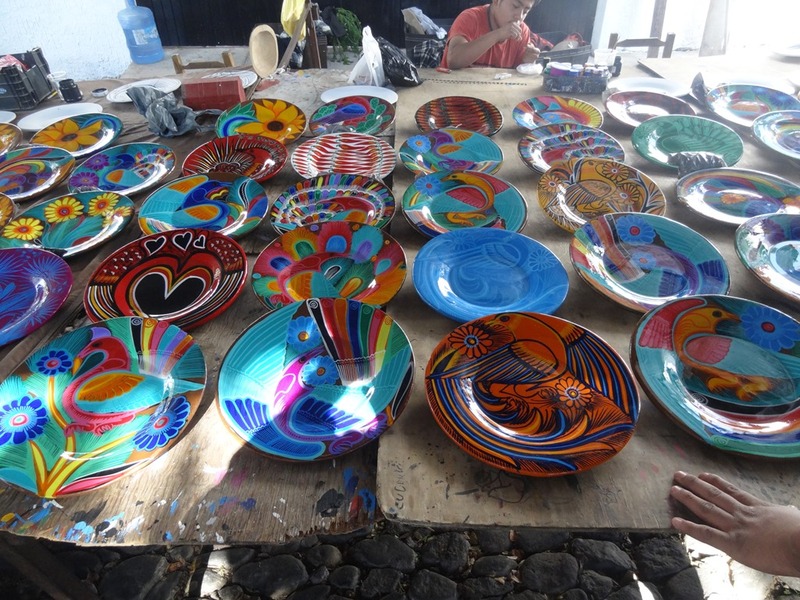 We really liked these colorful plates and wondered if we might be able to use them to eat from. Alas, they are made only for display, since they use lead-based glazes, so you can’t eat off them. 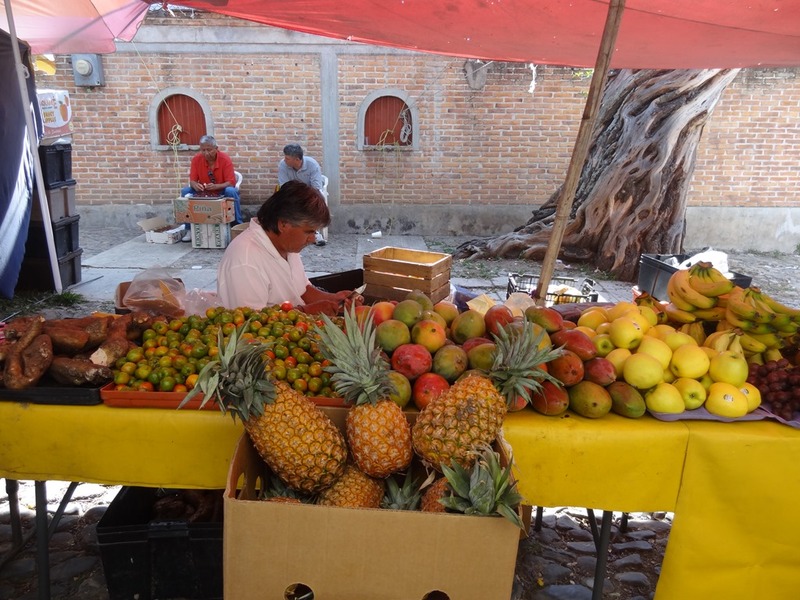 More fruit, and pineapples that seem giant after the ones in India. There are mangoes too. Carol thinks these are better than the Indian ones! This is heresy though to our friends in Tiruvannamalai. 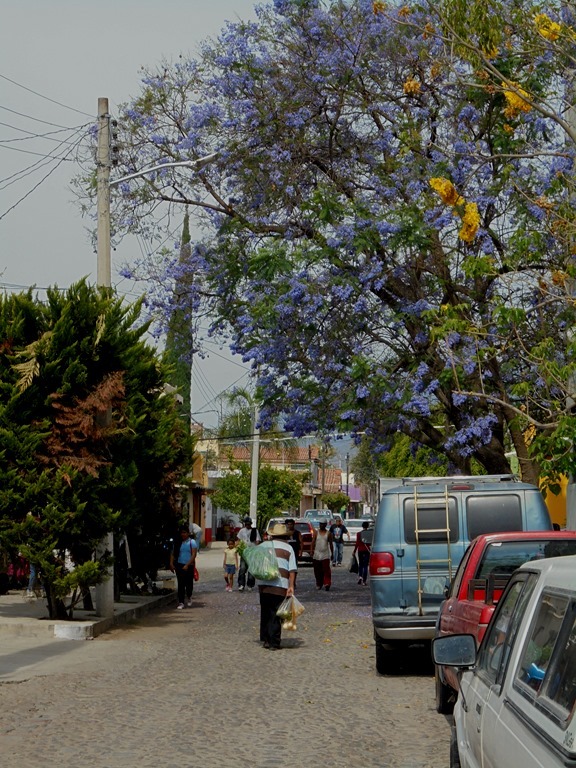 Leaving the market, I notice the purple jacarandas, and another yellow-flowering tree. 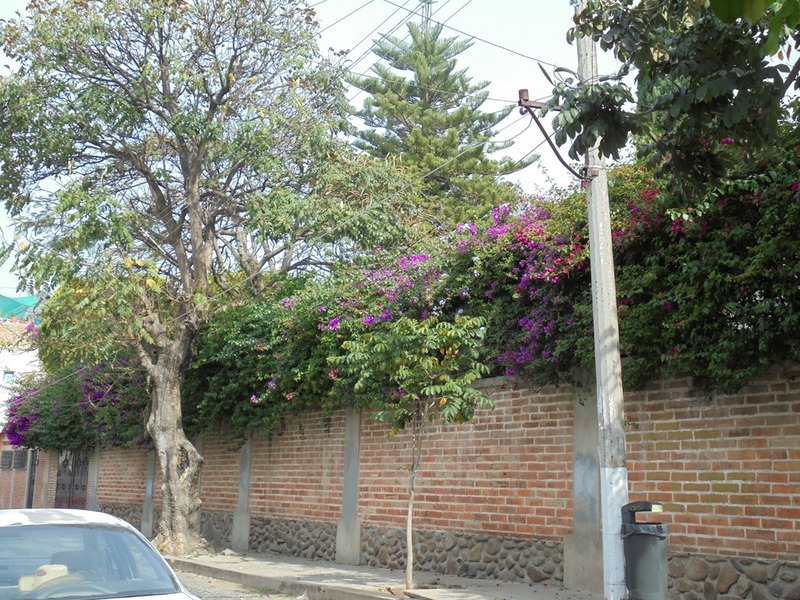 A brick wall topped with bougainvilleas, probably enclosing some rich person’s house. A wonderful corner house, with a balcony on the front. North of the city the hills rise, covered with trees. 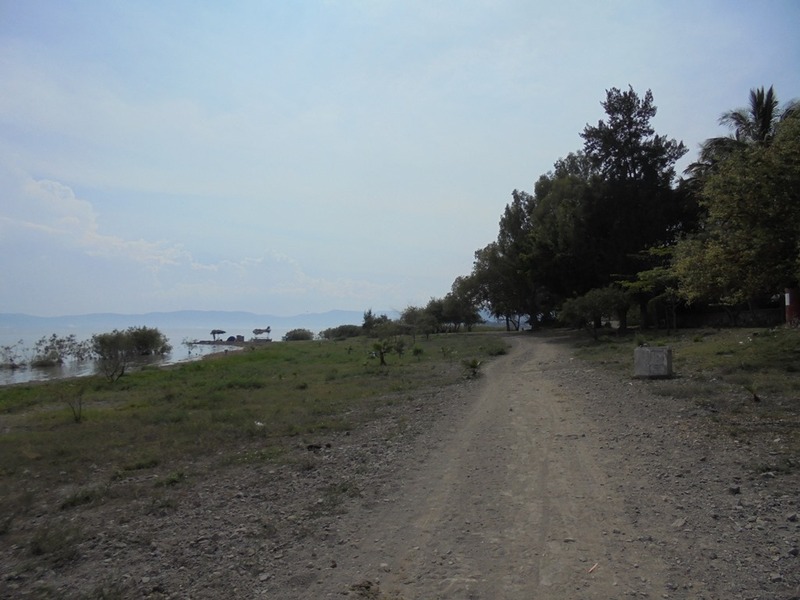 The towns here are in a narrow strip between the lake and the hills. 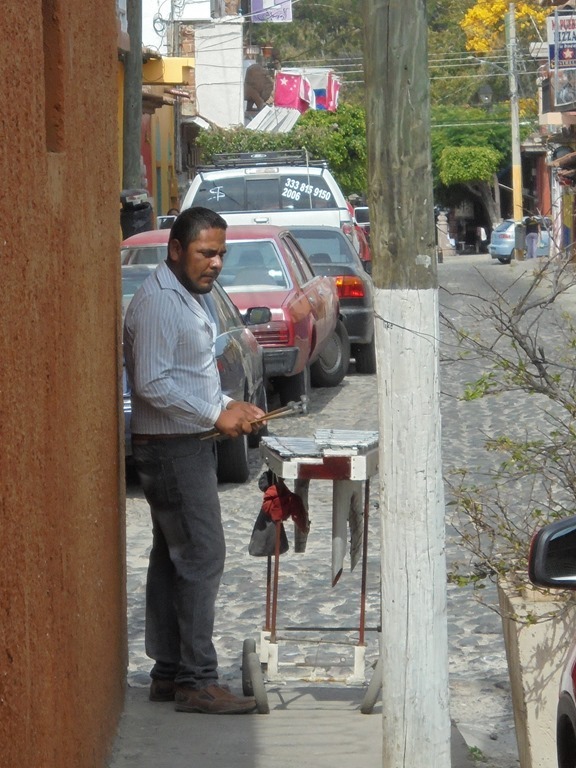 A street musician, playing his marimba for donations. 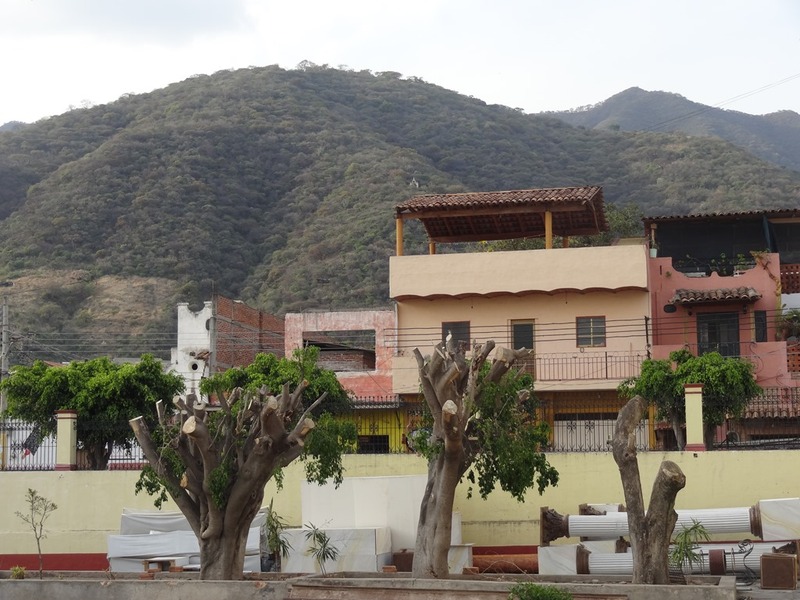 These structures atop some buildings show how locals prize their views of the lake and the mountains. 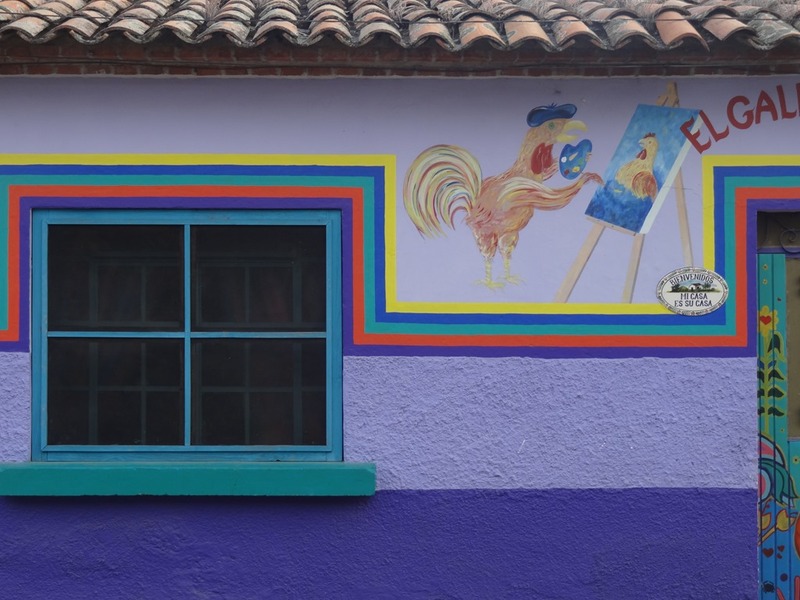 Painted walls show the offerings of many of the local shops. 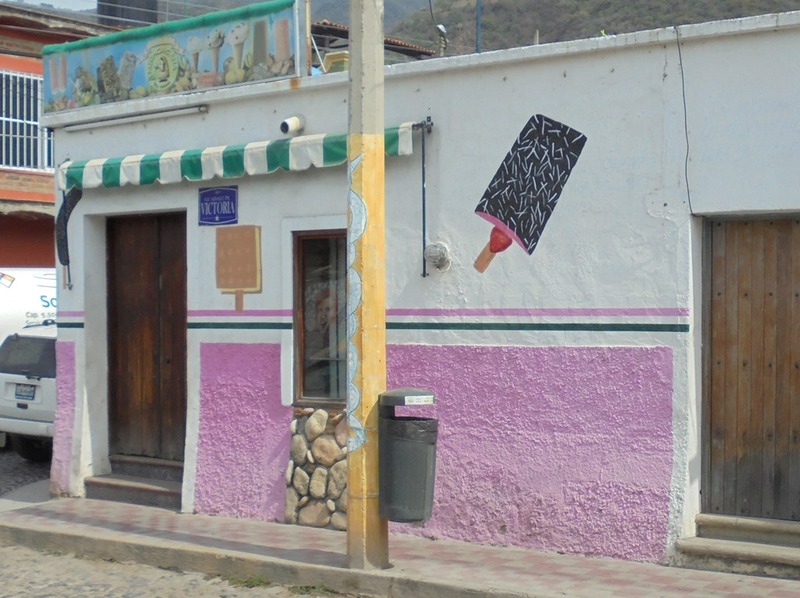 This is an ice cream parlor. We enter the plaza area again. 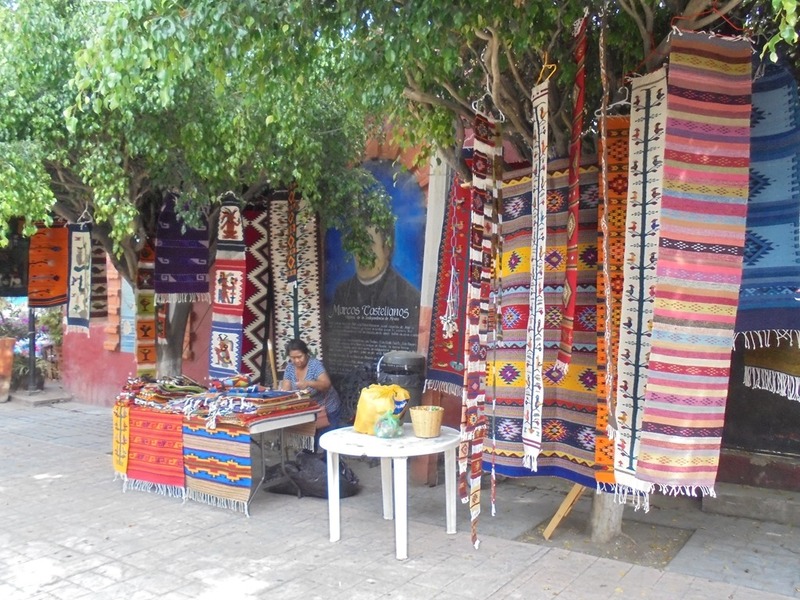 There is a serape vendor here. 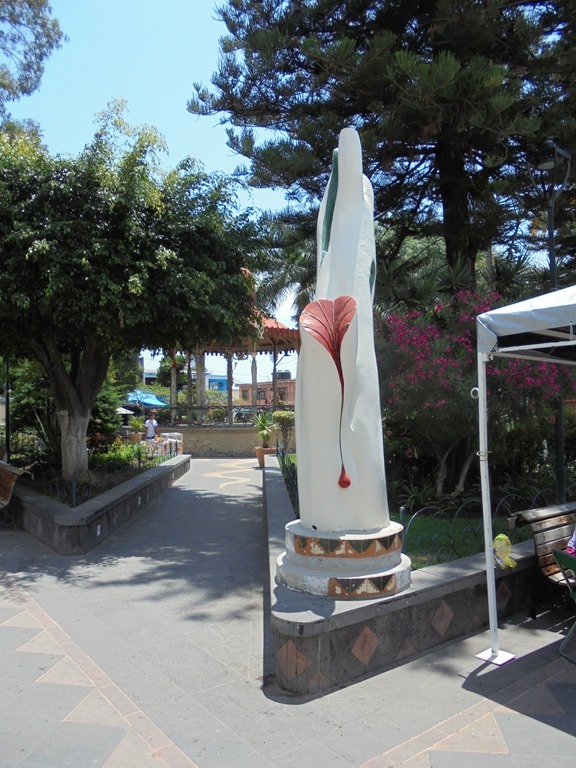 The plaza features several interesting statues. Some show the theme of this lake, as a legendary place that collects all the waters from the mountains. The one below has a face, from whose mouth flow the waters of the lake. This one exudes a very female sexuality. 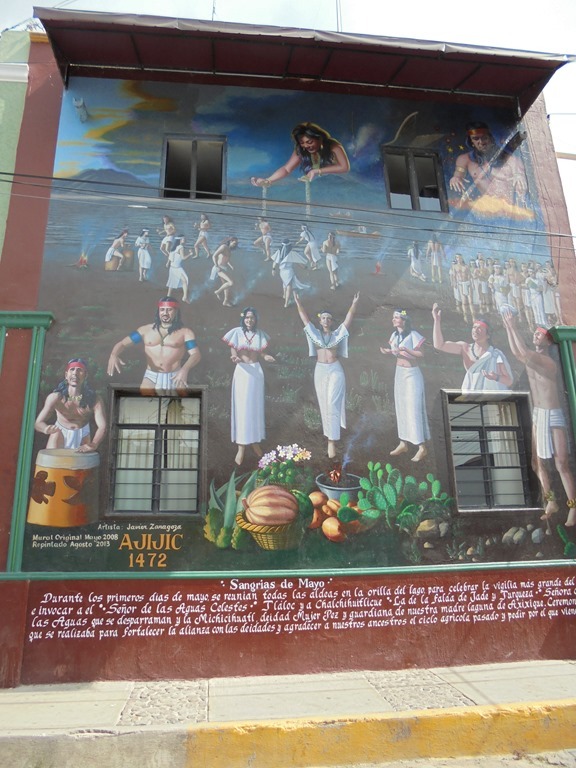 Painted one the side of an Ajijic municipal building is this mural, showing a legend from before the time of Columbus. Probably the oldest church in town. I say this since it faces directly onto the plaza. One of two places I have seen so far that offer Thai food. 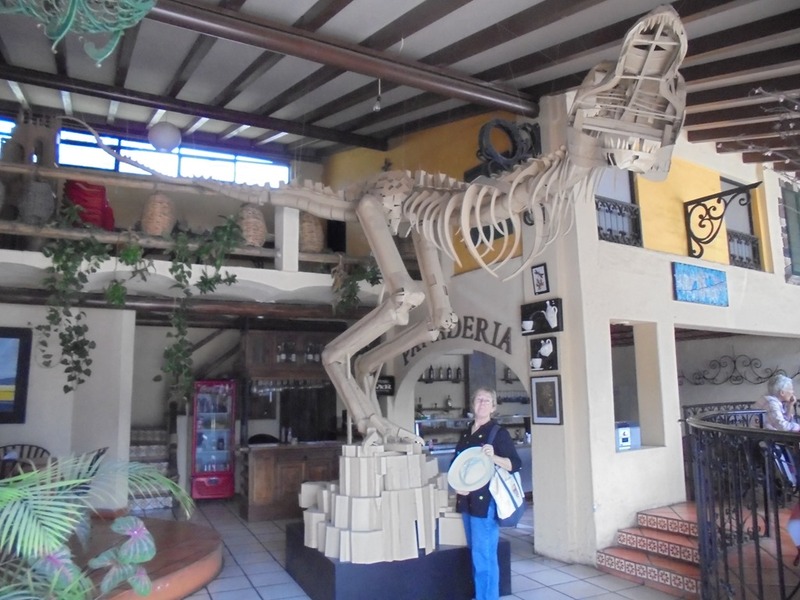 We ate breakfast today in a place with a Tyrannosaur in the lobby, crafted from cardboard. Mainly we see cars and few motorbikes. 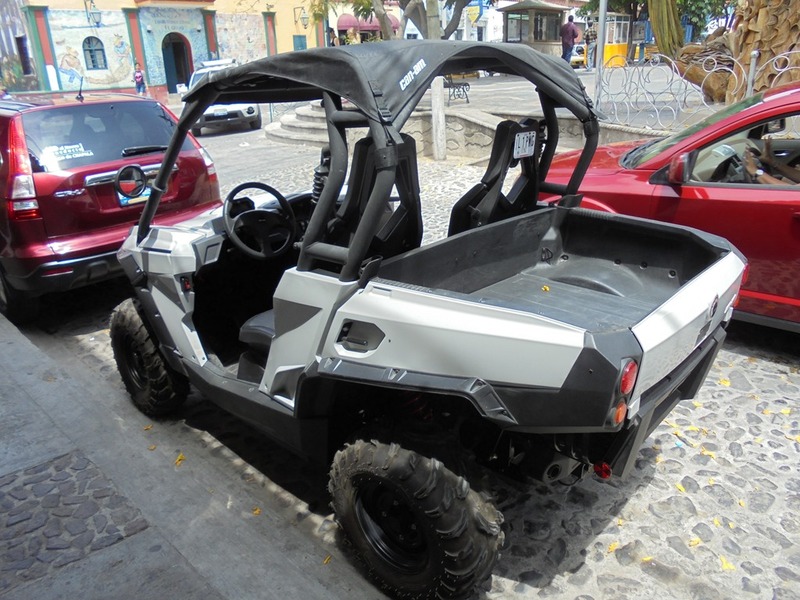 One kind of vehicle we have seen several of are various forms of 4-wheeler ATVs, “all terrain vehicles.” Here is the fanciest one I have seen. Here is another, outfitted for town use. 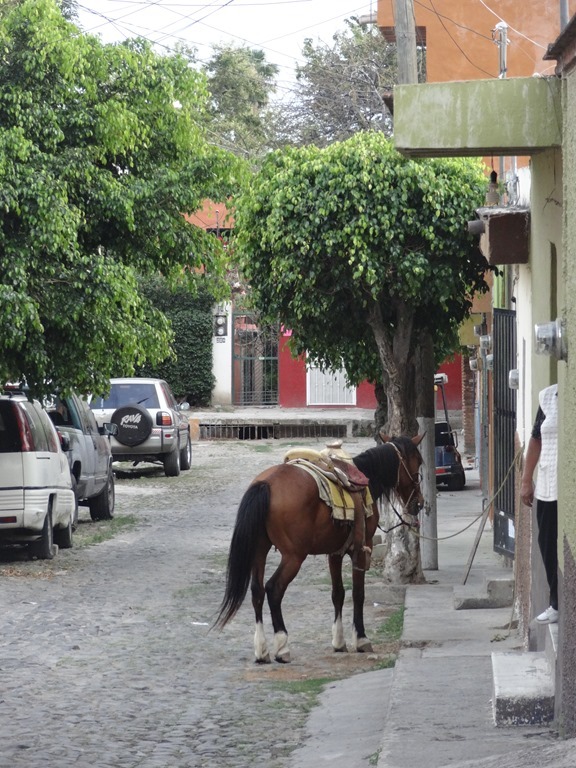 I think they use these in Ajijic because of the cobblestone streets. 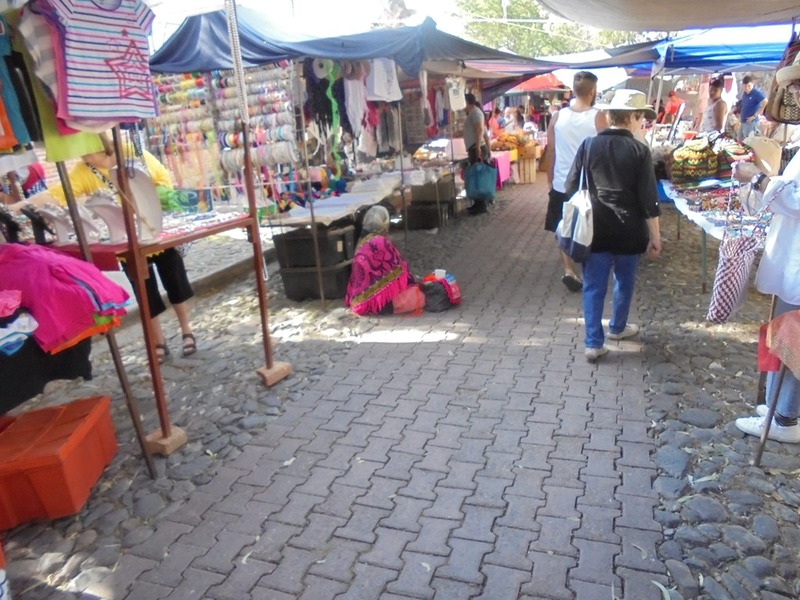 The expats think cobblestone has a charm, and so want to keep it that way. 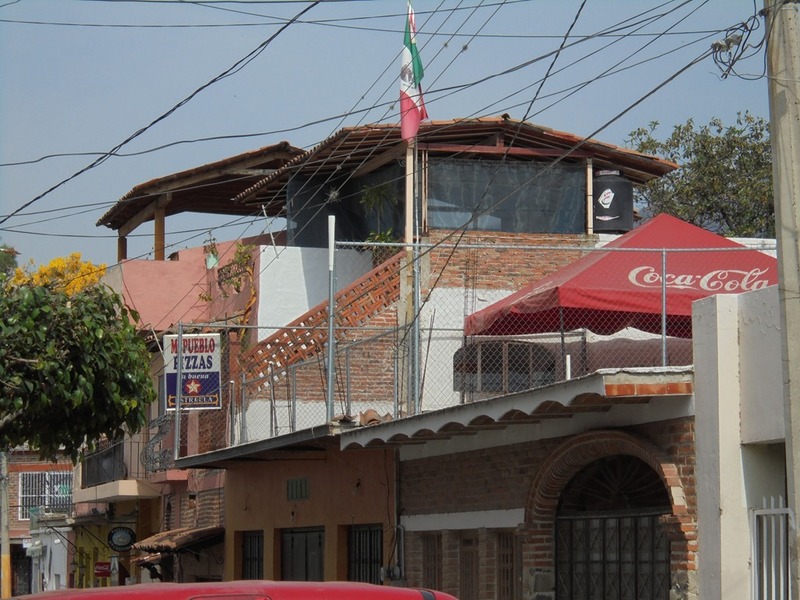 I have heard that the local Mexicans really just want streets they can drive on that don’t damage their cars. 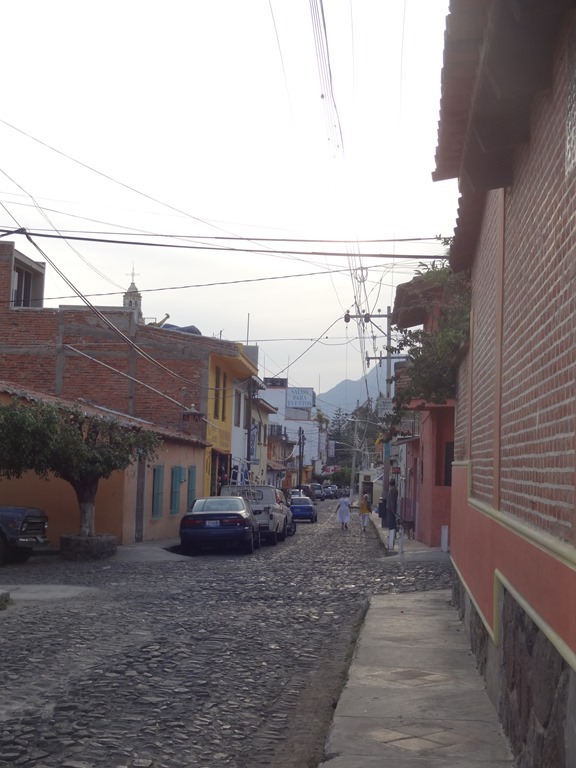 Another street view with mountains behind. 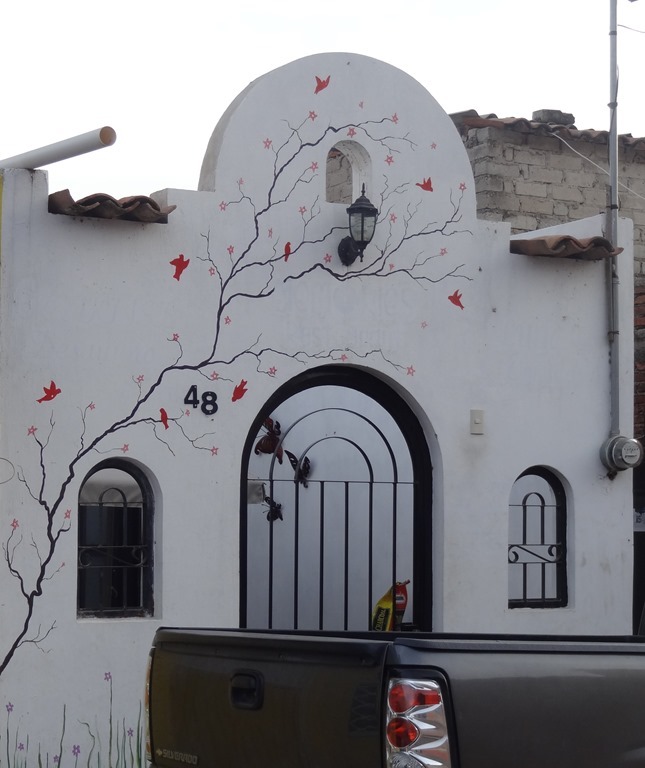 A nicely painted house, with flowers growing out windows upstairs. 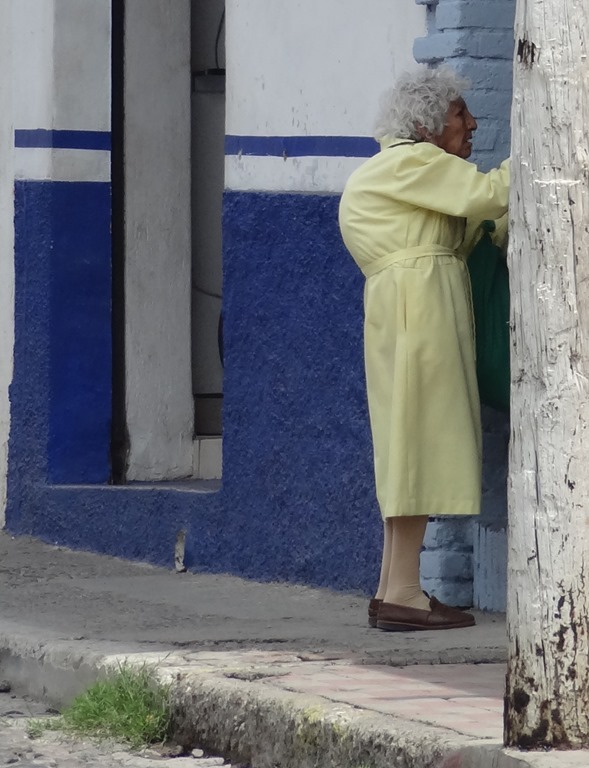 An old Mexican lady at the door of a house. We next walked out to the lake, going down a street near where we are staying. 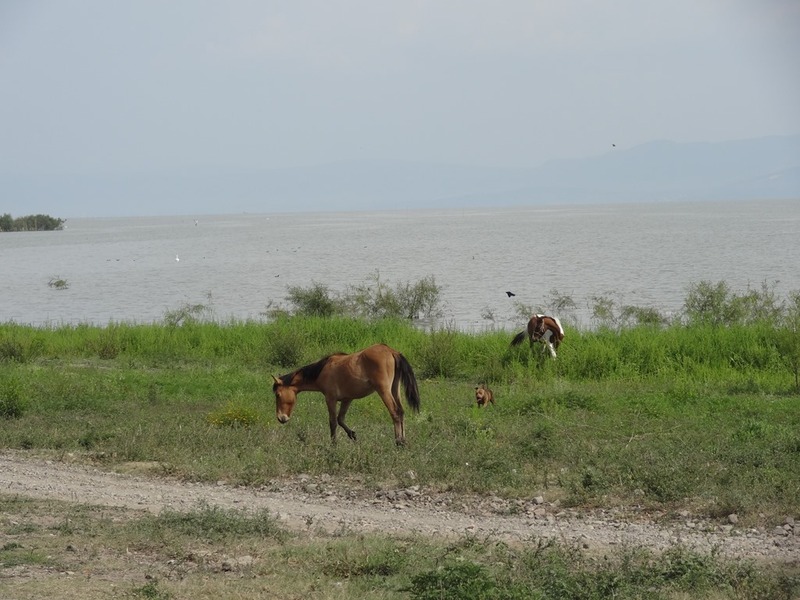 Lake Chapala is the largest in Mexico, 80 km long and 18 km wide. It has a surface area of 1,100 sq. km. It is kind of hazy, so we don’t see across the lake well. It does not seem too wide here. In this area there is a dirt path to walk down. A few horses graze here. 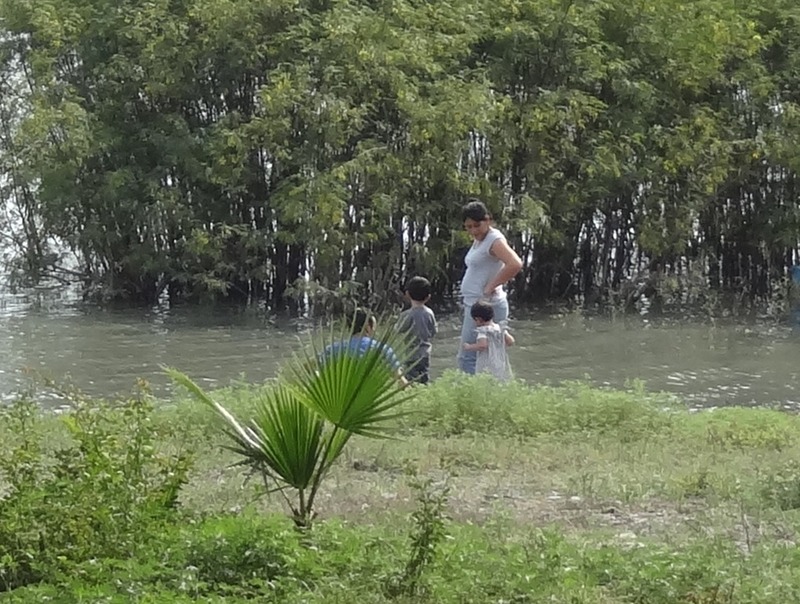 A family, mother, father and two children, plays at the water’s edge. 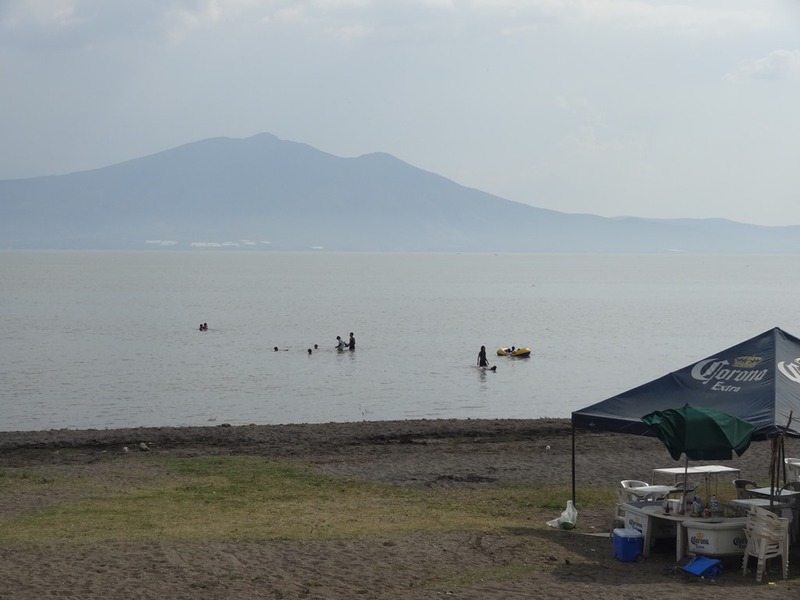 People swim in the lake. A few years ago it was polluted and nobody could swim in it. 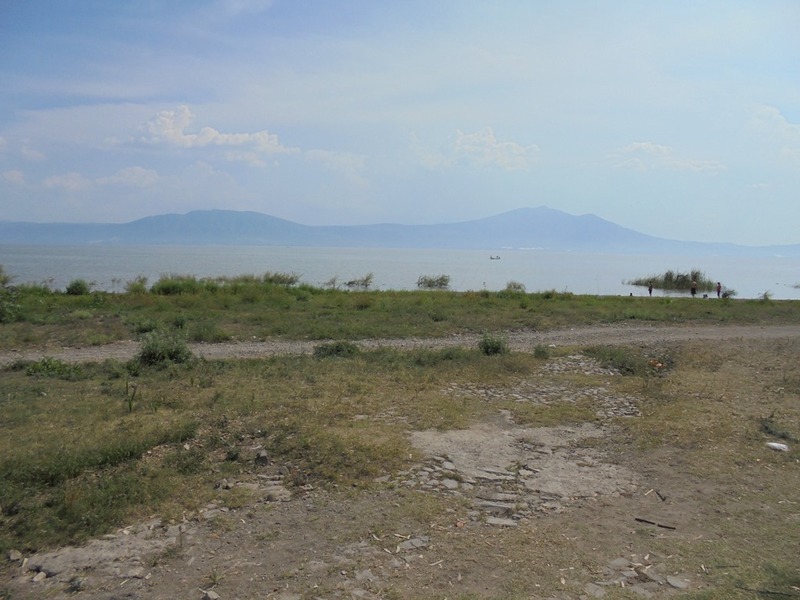 Now it is better, and people use it again and eat fish from the lake. 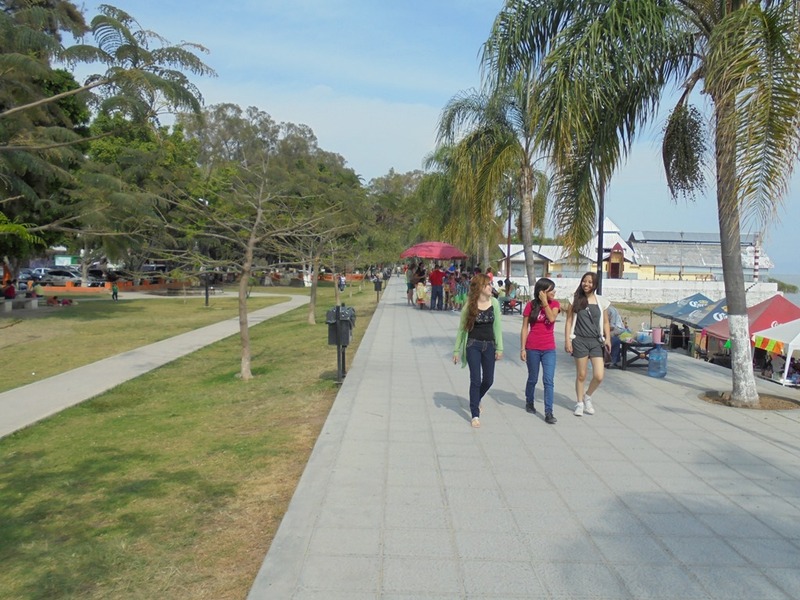 At the end of the main street that goes from the plaza to the lake, Colon Street, there starts a paved walkway and lakeside park. Many people, mainly Mexicans at this time of year, use this area for recreation. A lakeside café. 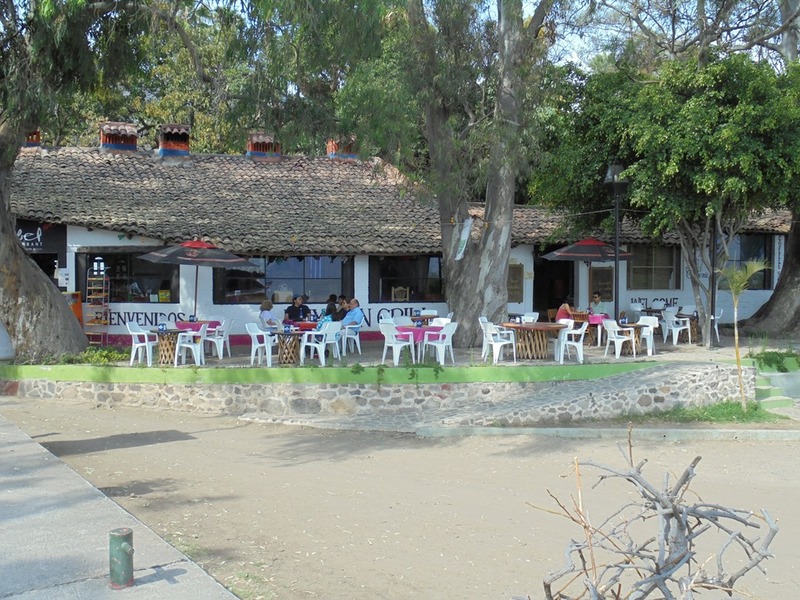 We had a good meal here and enjoyed the view of the lake and watching people. Starting the walk up Colon Street. 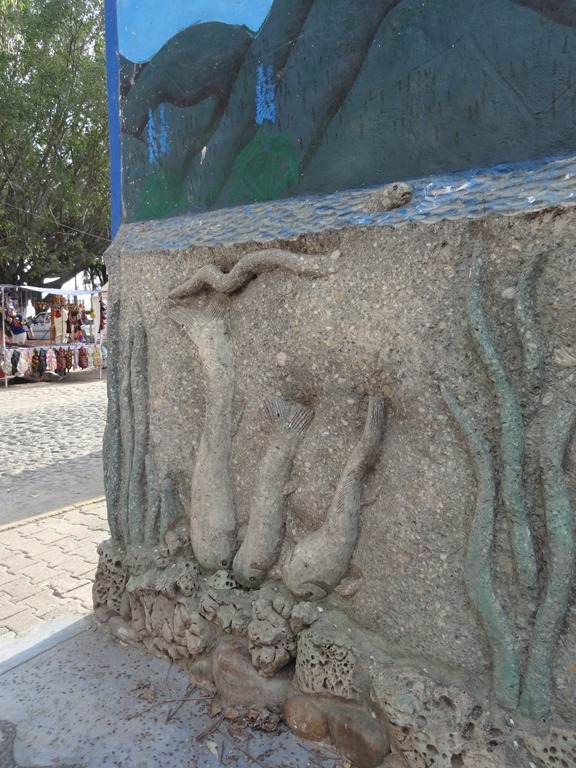 A bas-relief of the lake showing an underwater view. Catfish nibbling from the lake bottom. Many buildings are well decorated. 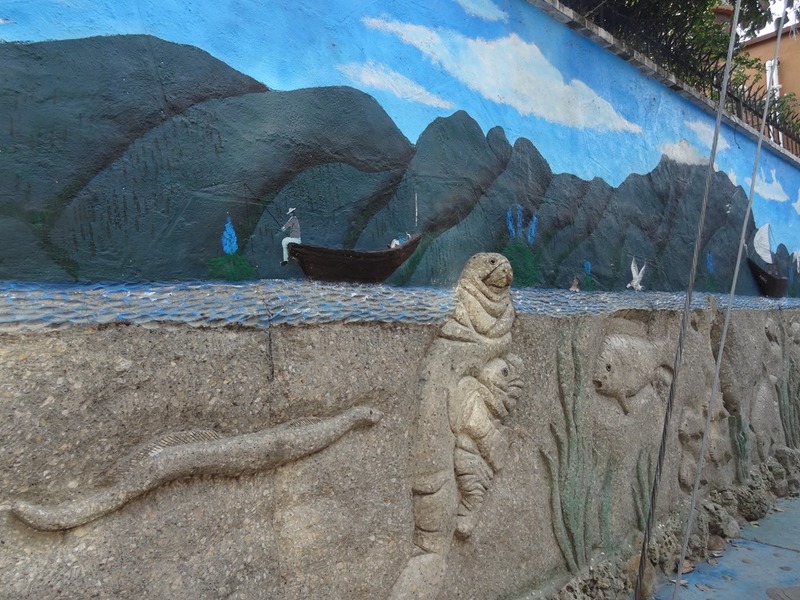 Here is a dragon on the side of an eating place. 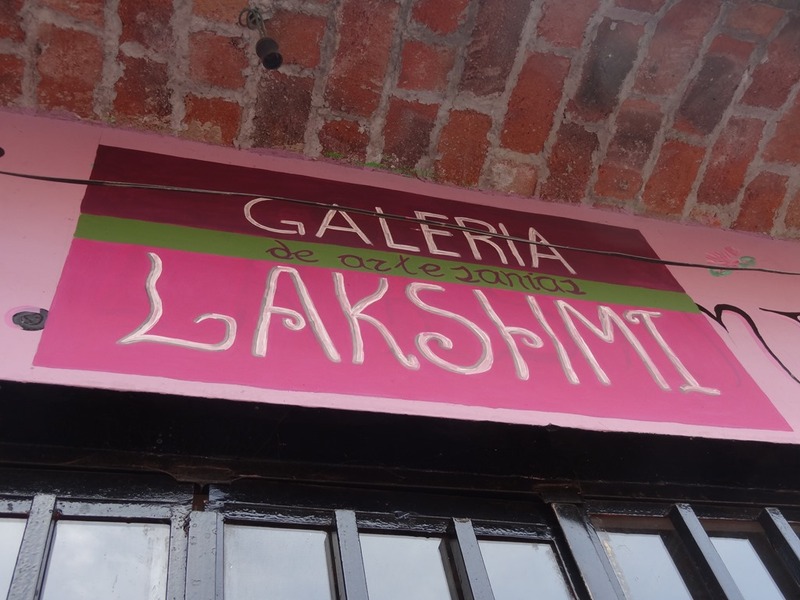 This must be one of the most well-known of the Ajijic decorated buildings. A skeleton playing the trumpet. 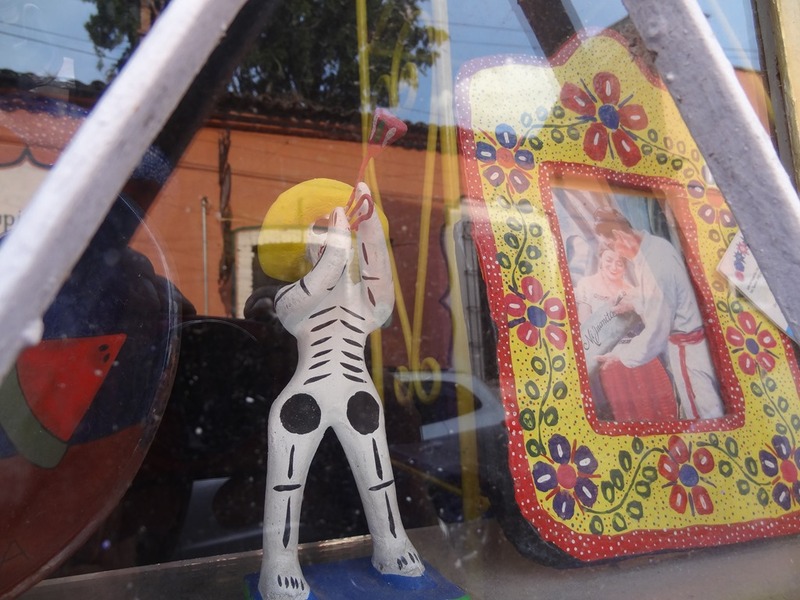 Skeletons and skulls are popular Mexican folkloric images. I do not yet really know the story behind this fascination with the skeleton here. 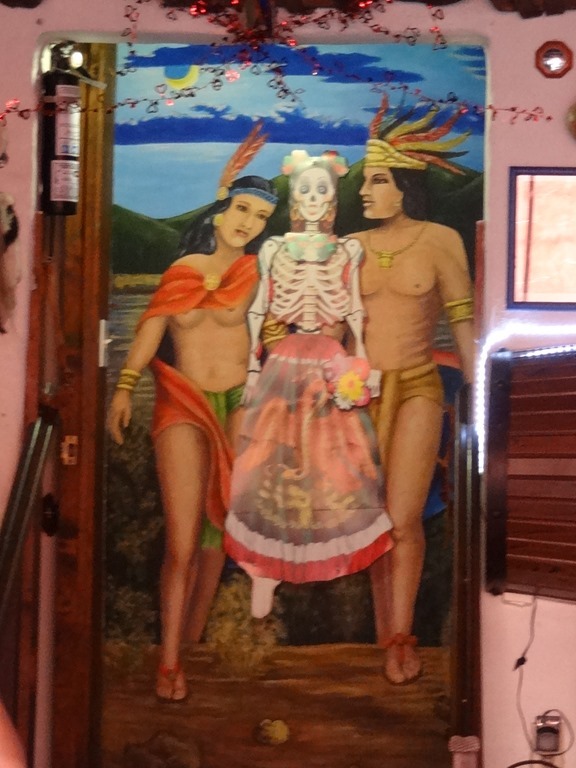 Here is another skeleton, this one in a painting showing native people. We saw two places with Asian Indian names. We did not see much in the way of Indian goods in either place. 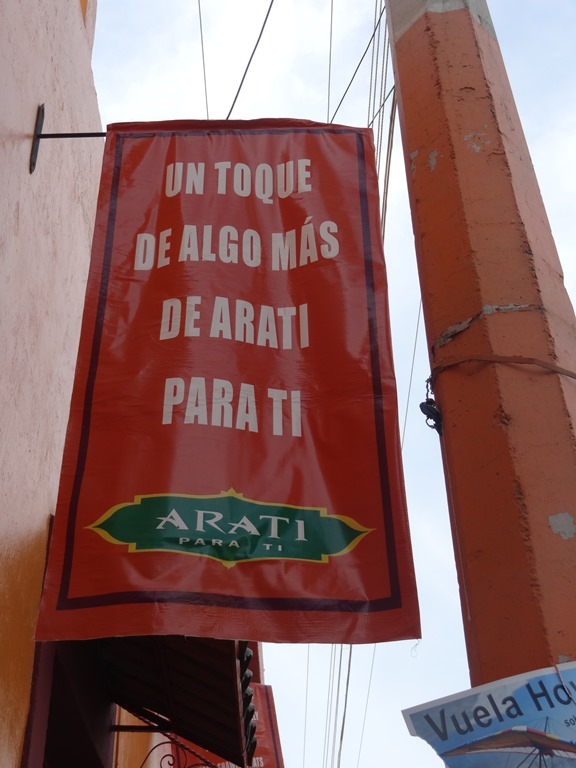 Here is a banner for Arati, the Hindu fire worship. Talk about attractive decoration! I like this one very much. 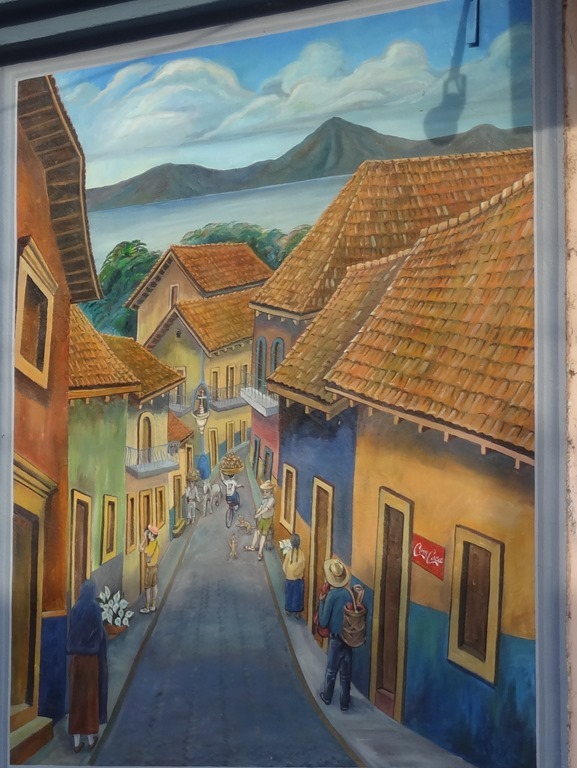 A painting on the side of a building showing what is probably an idealized view of old Ajijic. One shop has cubist paintings at the entryway. 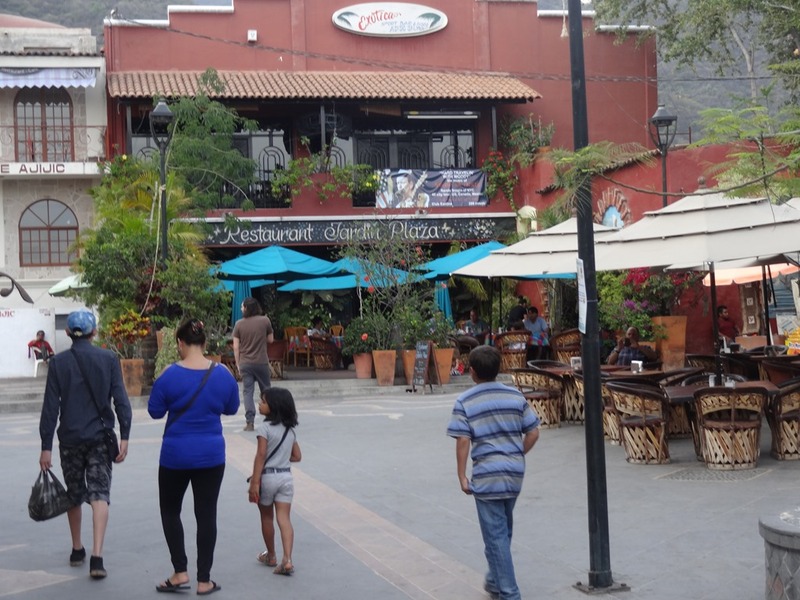 Off the plaza is a place that is already one of our favorites. 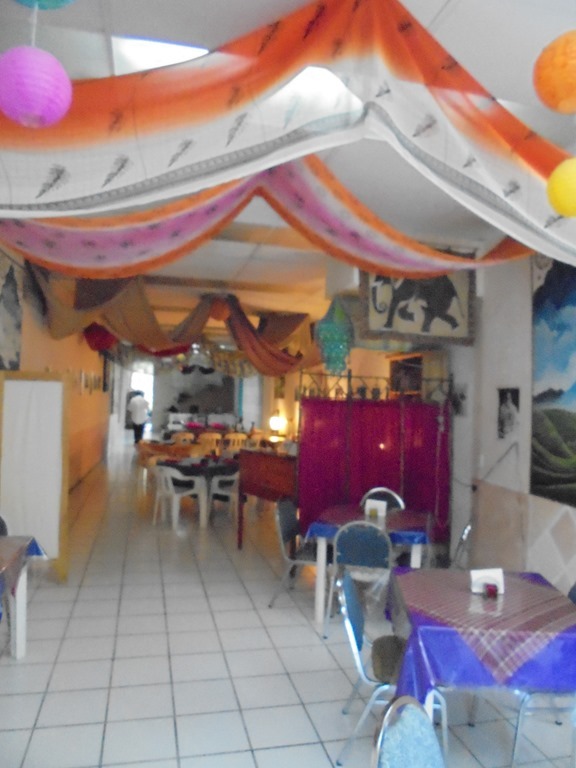 It is the only Indian restaurant in the area, Jasmine. 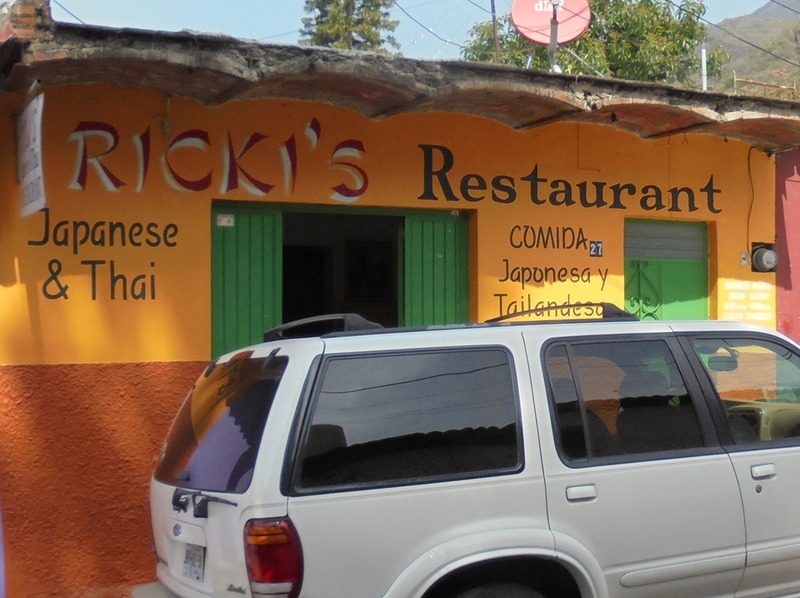 The best vegetarian food in Ajijic can be found here. And for non-veg eaters their lamb kabobs are to die for. 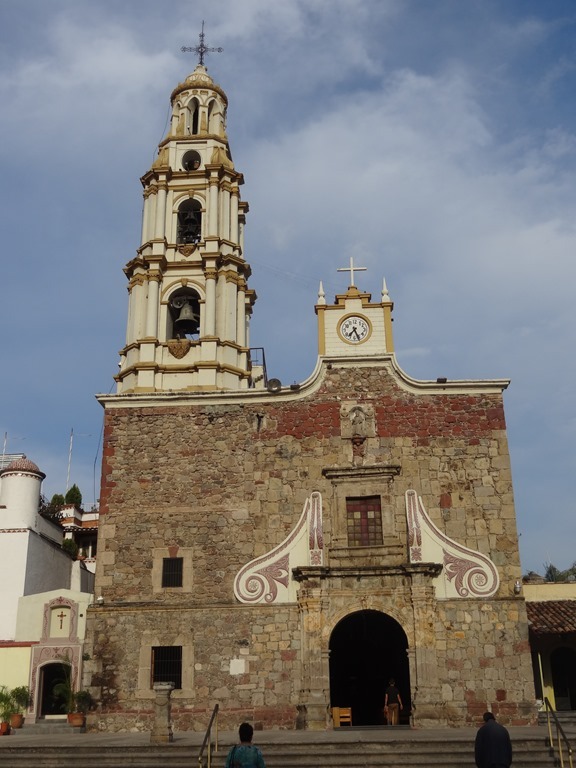 The largest church in town. 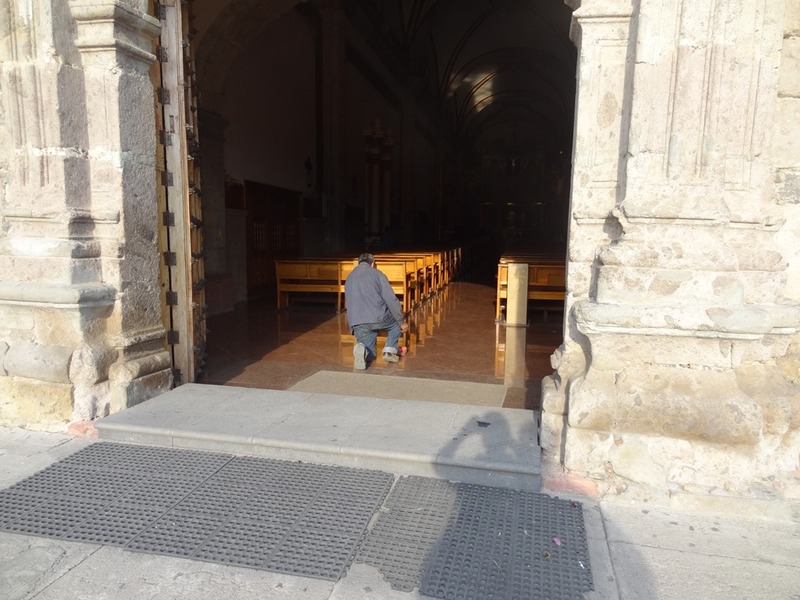 A man stops to pray at the entrance. His devotion seems as great as any we saw in Mother India. 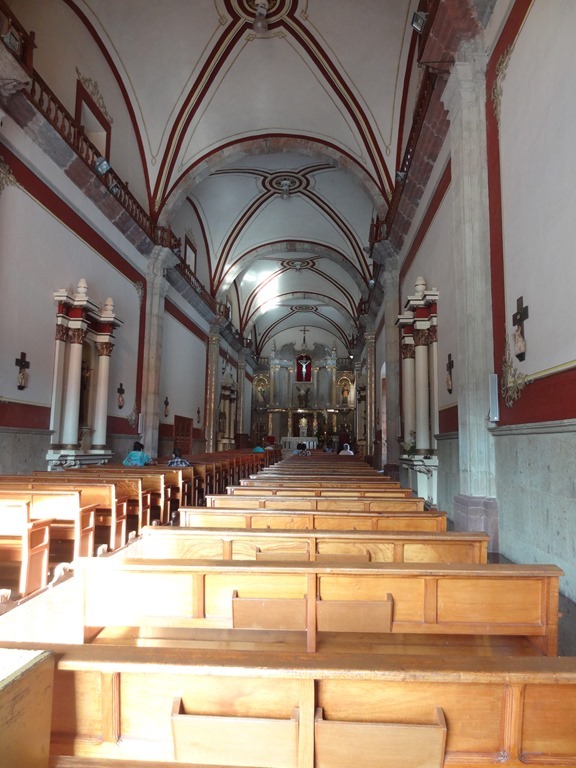 The interior of the church. 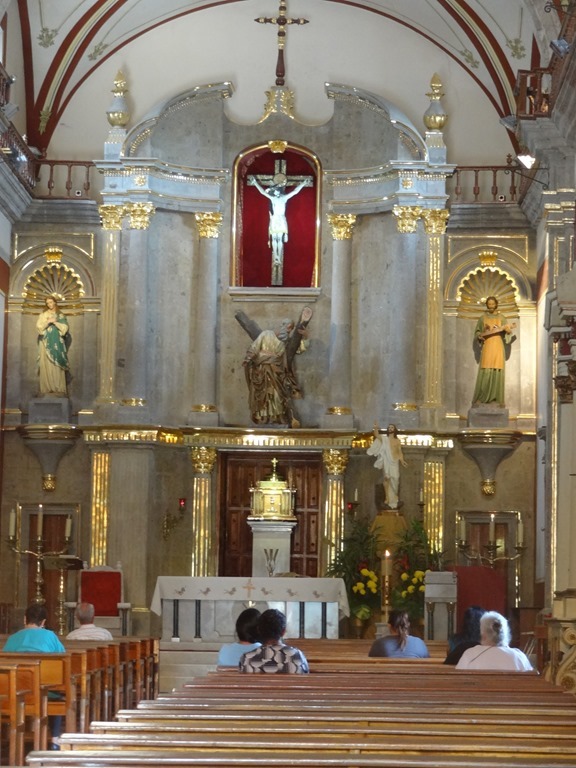 We had hoped to see elaborate gold fixtures, like we did in the cathedral in Cuzco, Peru. Nothing so fancy and rich here. The main altar. It looks like there is some gold here. The hillside behind the church. There are some carved pillars lying next to the fence. Maybe some planned improvement? 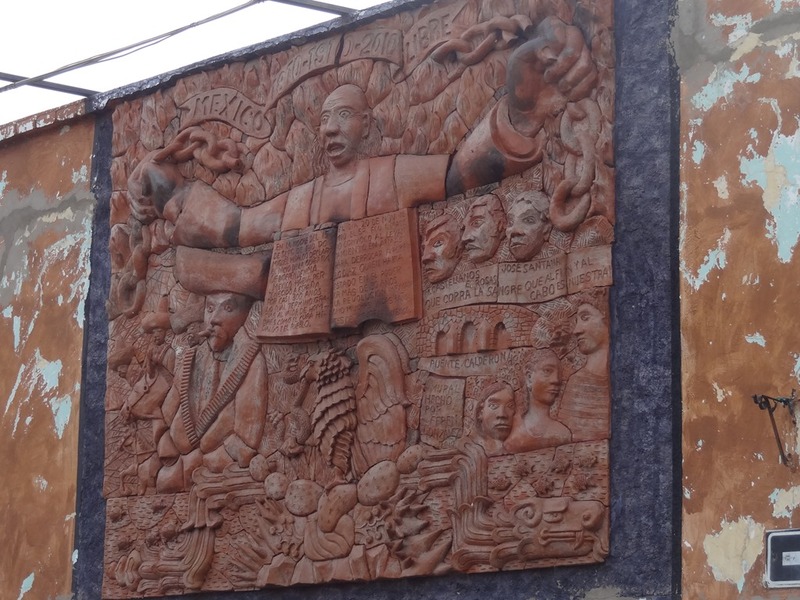 Another big bas-relief. I have no idea what this is about. 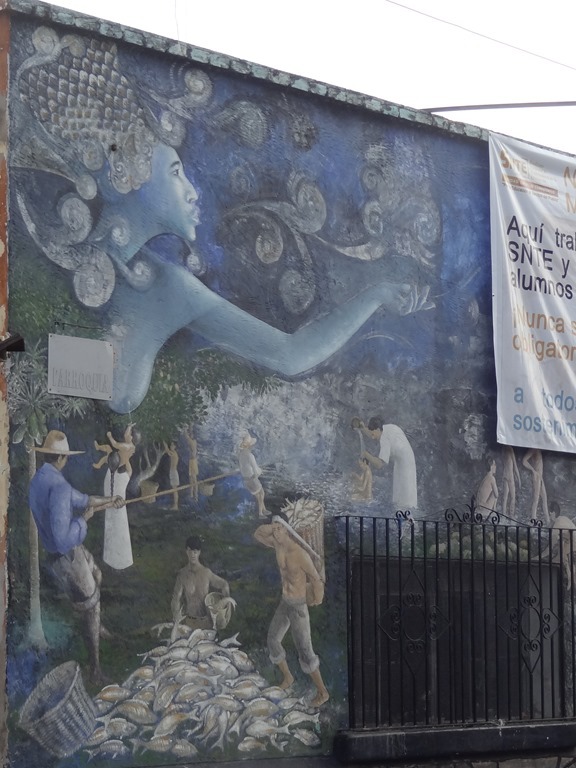 This painting on the side of a building shows a mythical view of Ajijic, with the Goddess giving loads of fish the fishermen. In India images of gods, especially Ganesh, are common. Here it is images of Virgin Mary. 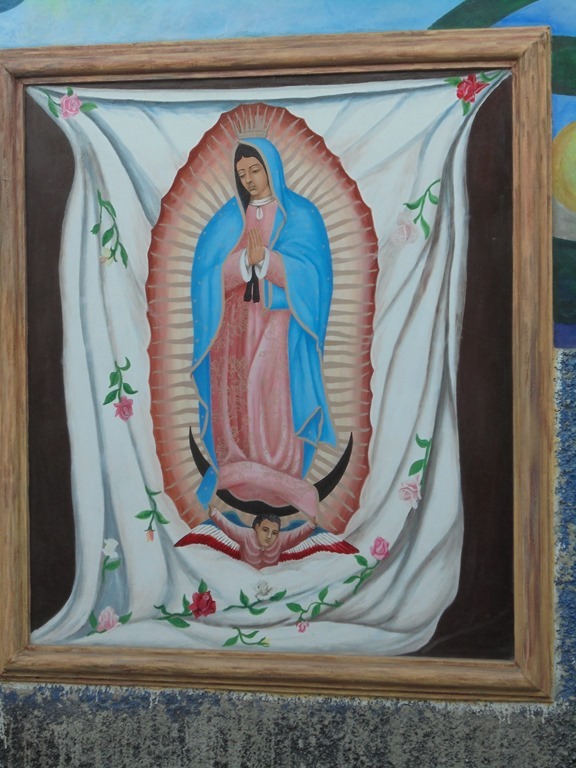 Here is a painting of the Virgin on the wall of a store. The streets seem so clean, much less trash. Here is part of the reason—a daily trash pickup. 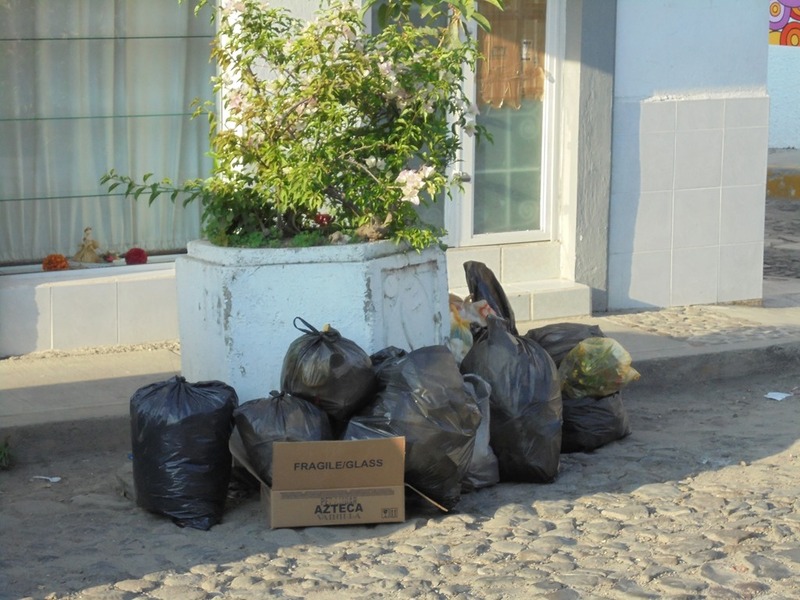 Just leave your bags of trash out on the street, and they will be collected. This simple thing seems so amazing after our years in India. We are nearing the place where we stay. There is the horse again. 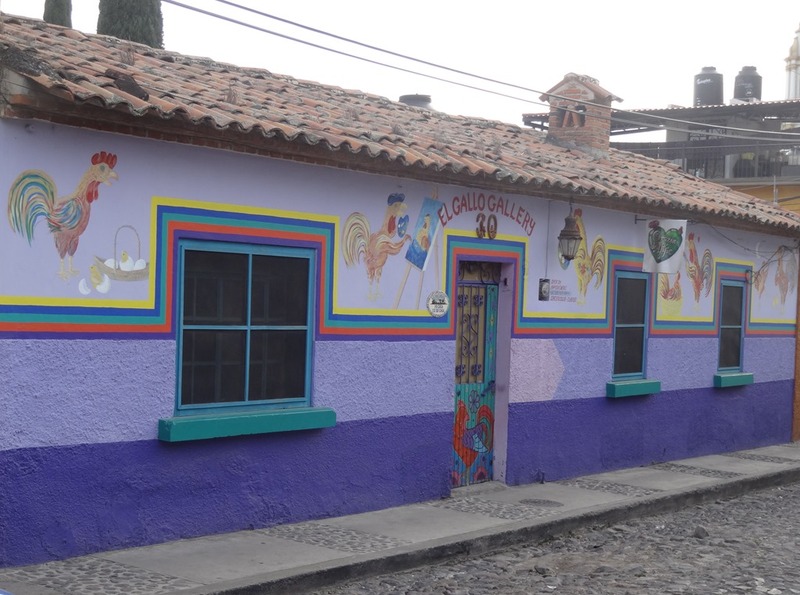 Ajijic is a charming place with great weather, colorful buildings and much painted decoration. I can see why it is a popular place for expat living and for seasonal visitors. We will write more about it as we get to know it better. For now I wanted to share these first impressions. 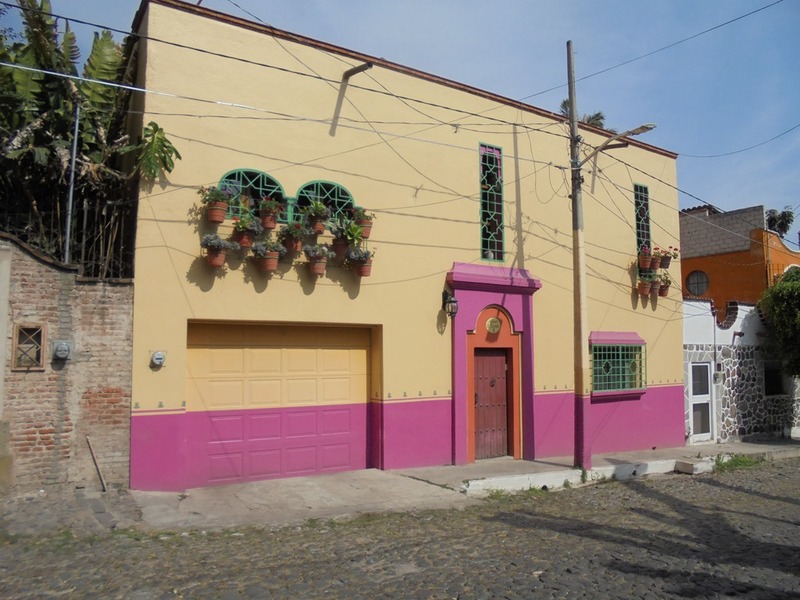 This entry was posted on April 11, 2015 at 8:17 am and is filed under Ajijic, Lake Chapala, Mexico. You can follow any responses to this entry through the RSS 2.0 feed. You can leave a response, or trackback from your own site. This was really great, and I am looking forward to seeing the area next week. This blog is not dated so i don’t know when this was written but are you guys still there? The article is from bout 3 ye1rs ago. We are still here. Contact me at richard@infinitepie.net and maybe we can get together. Thank you so much for sharing your experiences. 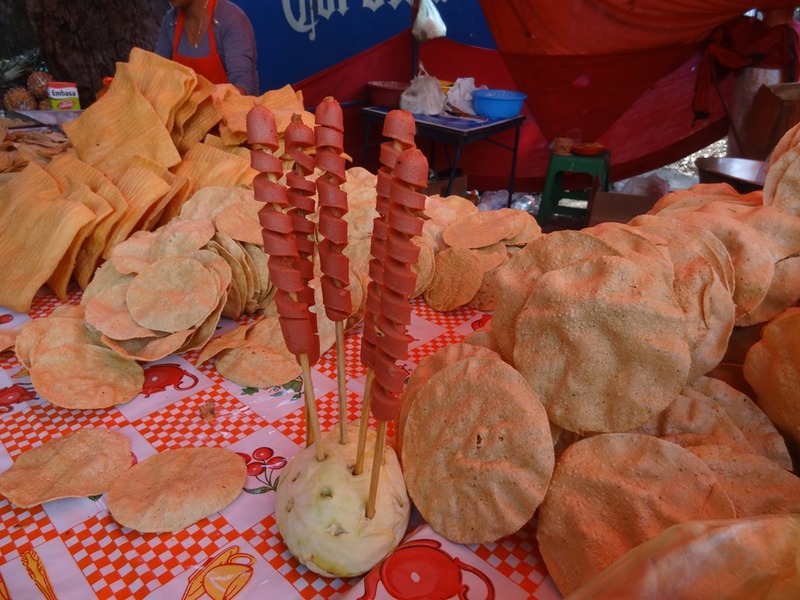 We lived in Oaxaca for 18 months. I love this ability to live vicariously through your blog. 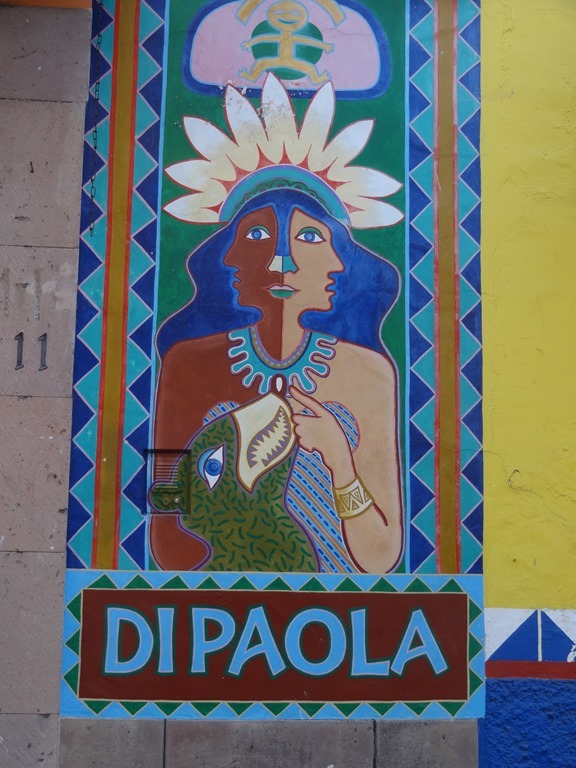 I enjoyed your photos and stories of India and look forward to your impressions of Mexico. Very nice pictures. 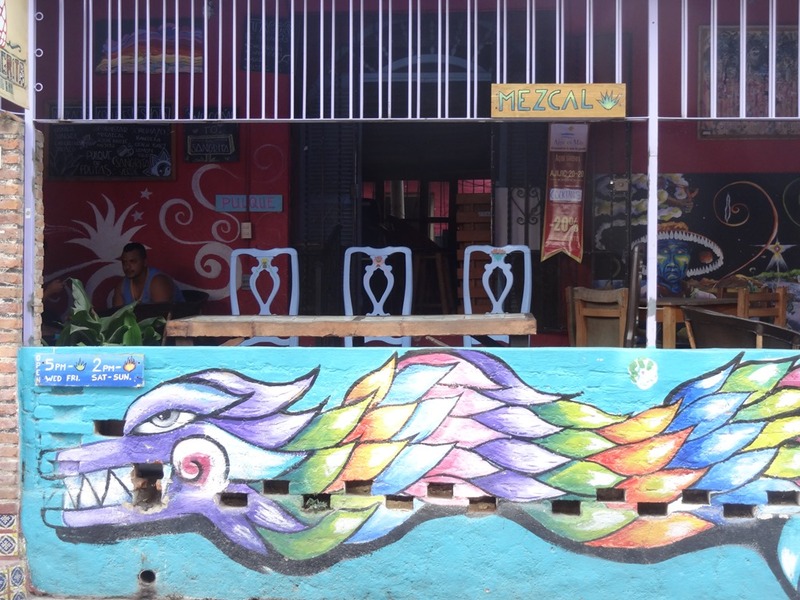 The “dragon” on the side of the restaurant is Quetzalcoatl, the Nahuatl name of the feathered serpent, a very important deity in pre Columbian – pre Hispanic central Mexican culture. The “fascination with skeletons/death” has to do with the rituals and adoration some peoples in central and southeastern Mexico (the Aztecs, the Purepechas, the Mayans) had for their dead ancestors and relatives, and also with Mictecacíhuatl (roughly the goddess of death), an important Aztec female deity from pre Columbian – pre Hispanic times. The Virgin Mary you will see over and over and over everywhere in Mexico is the mestizo (mixed native Mexican indian and Spaniard) Virgen de Guadalupe, the “brown” virgin Mary as she (allegedly) appeared to a native Mexican peasant named Juan Diego Cuauhtlatoatzin in the Tepeyac area of what is now Mexico City in 1531. 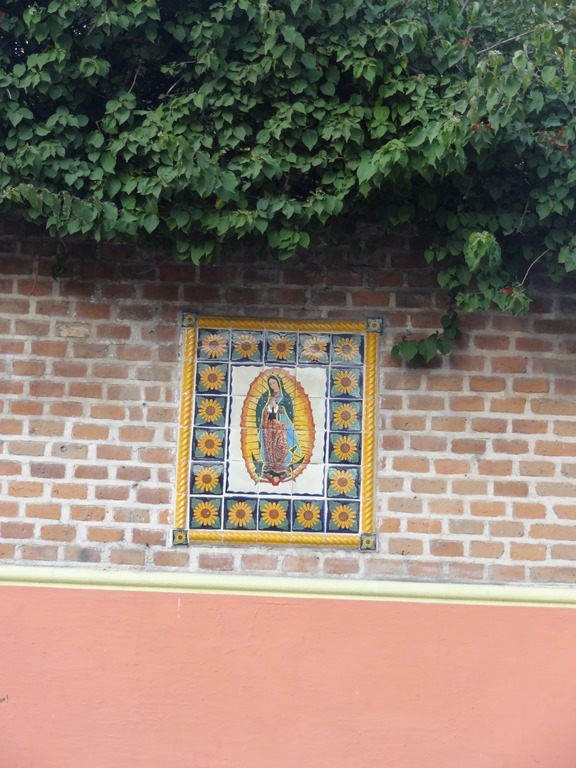 It is believed that the adoration to the Virgen de Guadalupe is directly linked to the pre Hispanic – pre Columbian cult to the Aztec goddess Tonatzin (or Coatlicue, Cihuacóatl or Teteoinan). Thank you for the escorted tour through town. Gallo is a rooster. Pollo is chicken in Spanish. Thanks so much for this delightful entry! 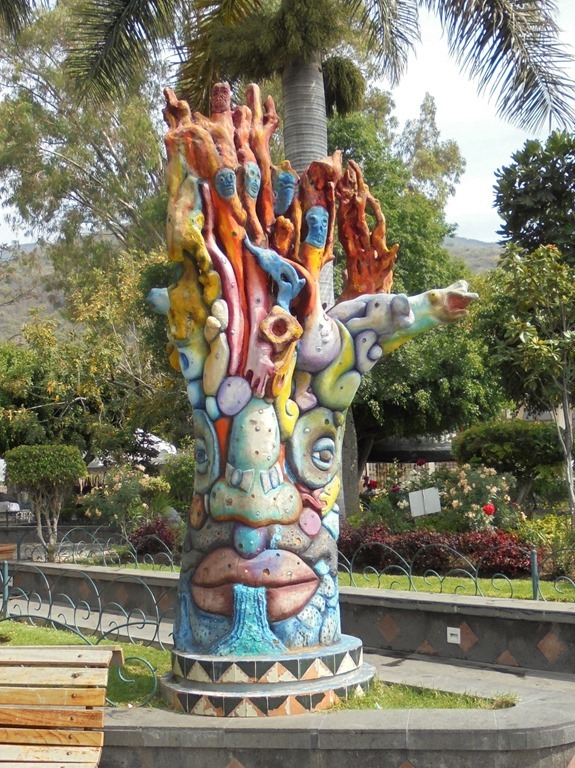 I have recently relocated from Ecuador to Ajijic, and am as enchanted as you are. I’ll share your blog with friends…you’ve really captured the essence of this beautiful place! 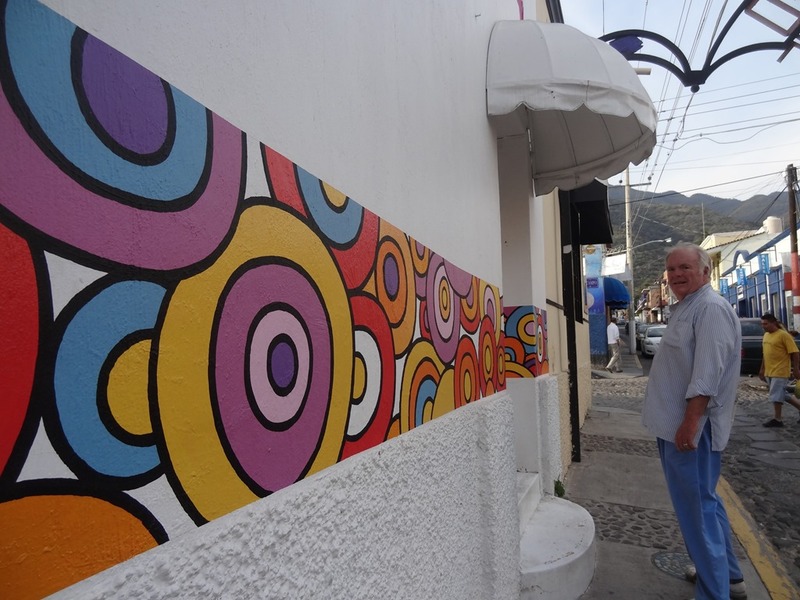 My husband and I have lived in Chapala for 9 years, you have given a fresh new perspective of our home. You have truly captured the unique beauty of Ajijic with your camera and your prose. 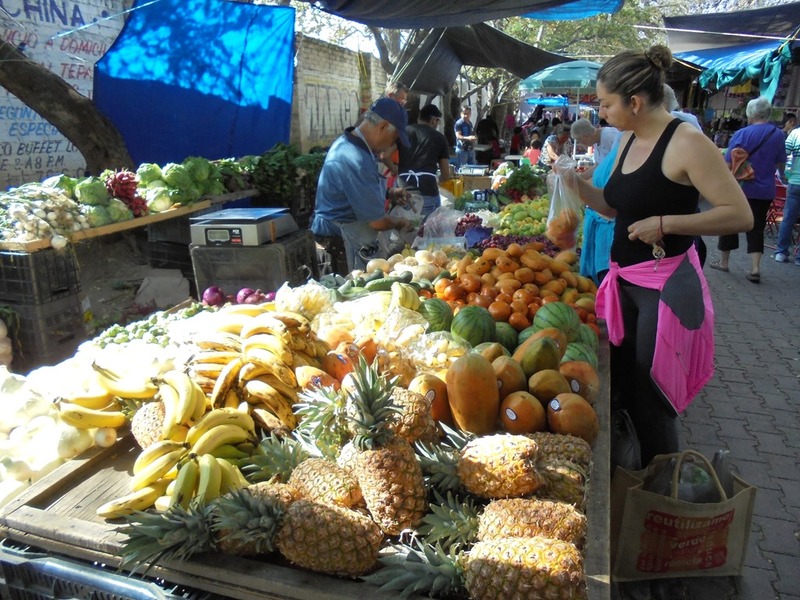 We also considered Ajijic ten years ago, then chose the Bay of Banderas because it gets a bit chilly in the mountains during winter. But it is a magical place, for sure. Enjoy! It’s no wonder you settled in the place from where you posted about the article; the corner pink house and the photos of further street with cars parked reminds me of some of the lanes opposite the “Pey” gopuram of Tiruvannamalai with the Arunachala in the background . I visited Tiruvannamalai just last week and remembered the our first meeting near the Raghavendra mutt from where you started your morning walk with your two dogs! wish you very happy days in your new place!